(1920s)^^ - View showing two men standing in front of an electric locomotive bearing a sign promoting the city of Glendale. The rail car is parked on the tracks, and bears a banner that reads “I am on my way to Glendale, California. The Fastest Growing City in America”. By 1920, Glendale had grown through nine annexations to over 7,000 acres. From 1920 to 1930, ten annexations brought the total area to 12,294 acres. The population would keep growing. It rose from 13,756 in 1920 to 62,736 in 1930. 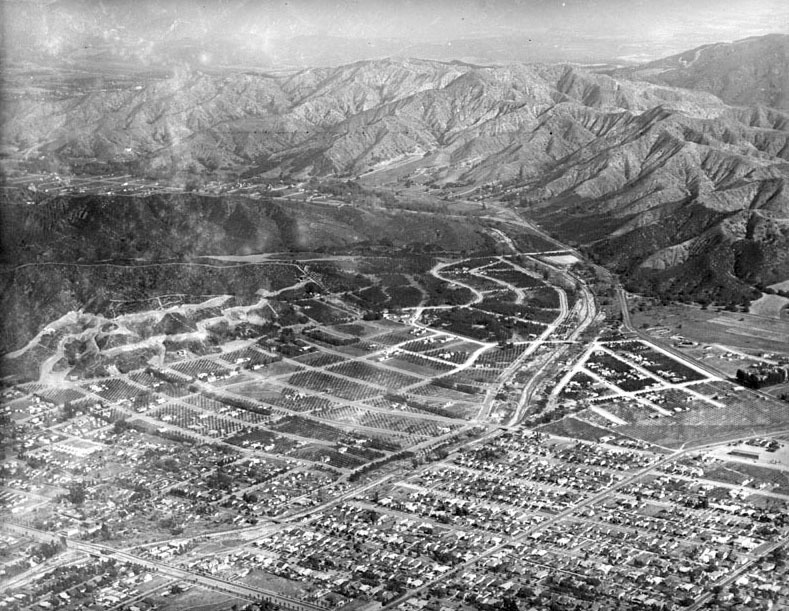 (1920s)^ - Aerial view of Glendale at the foot of the Verdugo Mountains with Verdugo Canyon and the San Rafael Hills on the right. Housing development is encroaching on the citrus groves to the north. (ca. 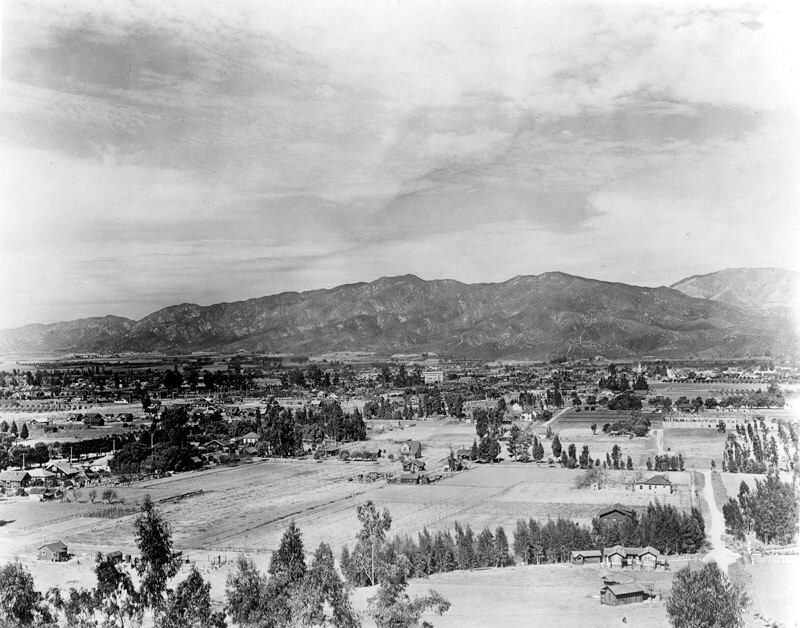 1927)^ - Aerial view of Glendale looking northwest toward the Verdugo Mountains. The intersection of Brand Boulevard and Broadway is in the center. The spires of the Glendale Presbyterian Church are visible to the right of Brand. (ca. 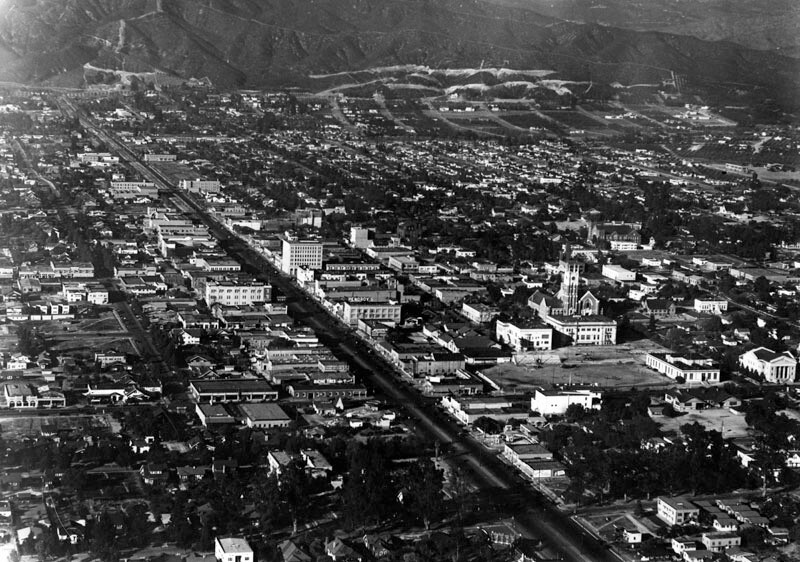 1927)^ - Aerial shot over Brand Boulevard looking north toward the Verdugo Mountains. 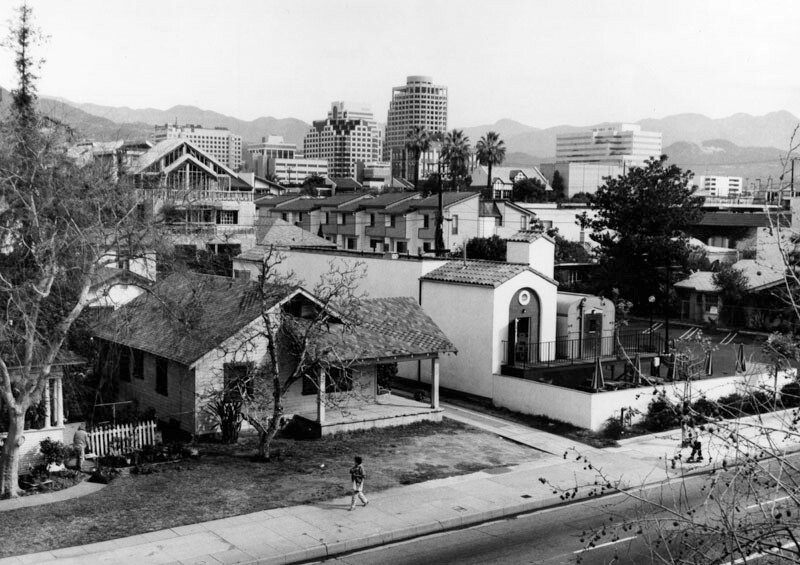 The two tallest buildings in view are the Security-First National Bank (NE corner of Brand and Broadway) and Glendale Presbyterian Church at center-right (NW corner of Louise and Harvard streets). 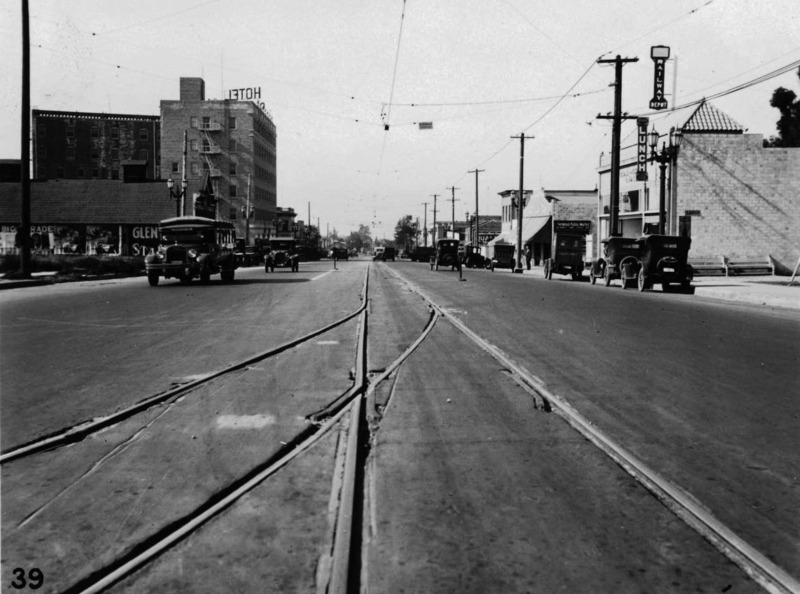 (1925)^ - View looking north on Glendale's Brand Boulevard, when power poles were still located in the middle of the street. An electric car is seen descending the street. Palm trees line the boulevard in the upper portion of the photo. During the 'teens and 'twenties Brand Boulevard grew into a lively, modern, commercial and entertainment street with banks, department stores, movie theaters and automobile showrooms, becoming the city's "Main Street". (ca. 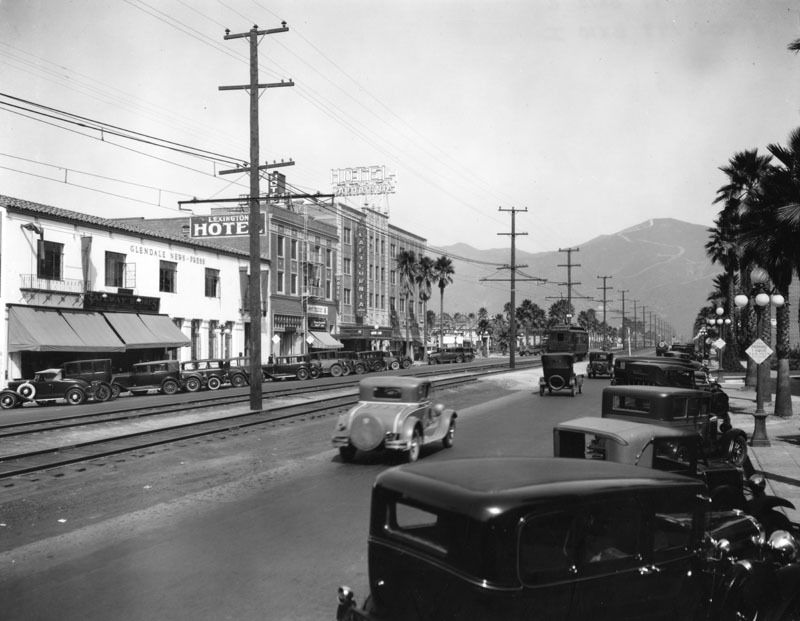 1923)^ - View shows several automobiles travelling up and down the business section of Brand Boulevard, in Glendale. Note train stopped in the middle of the road to pick up and drop of passengers. The 6-story building in the distance is on the northeast corner of Brand and Broadway. It was constructed by Security Trust and Savings Bank in 1923. 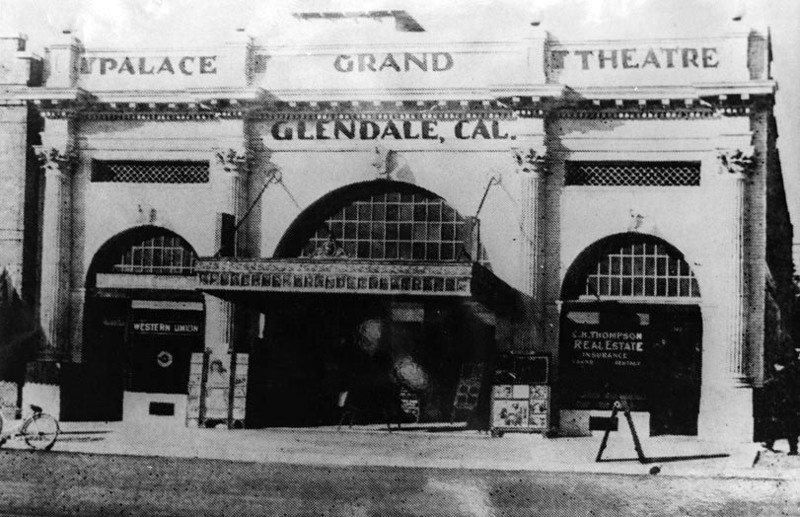 Glendale Theater can be seen on the right. (ca. 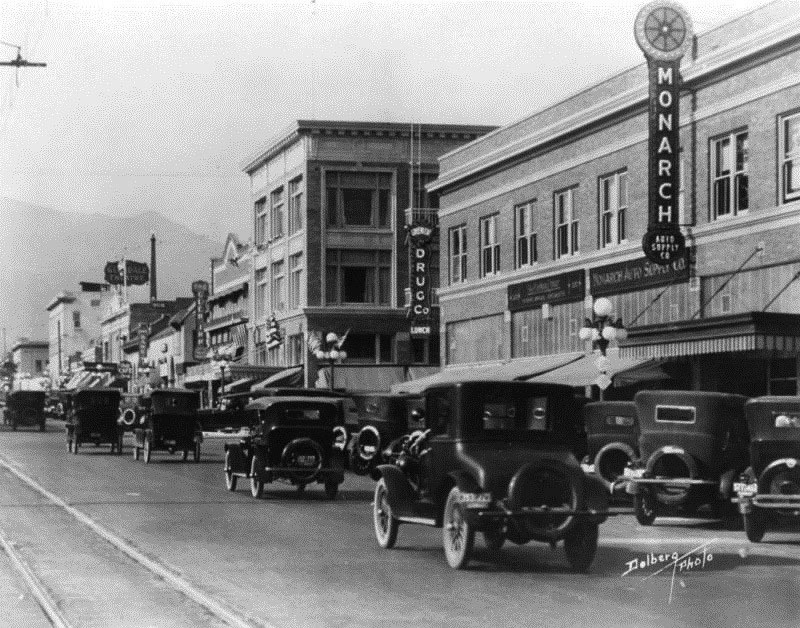 1924)^.^ – Street view looking north on Brand Boulevard. Monarch Auto Supply Co. and a drug store occupy the building on SE corner of S. Brand Blvd and E. Harvard St. seen on the right. The Glendale Theater can be seen in the distance. Today, the building on the SE corner of Brand and Harvard is occupied by a BevMo! Click HERE for contemporary view. (1924)^ - View from the middle of Brand Blvd. looking north. Pedestrians waiting just left of the train tracks for the Pacific Electric street car #566 to Los Angeles which is stopped at Broadway. Some of the businesses that can be seen include: "The Owl Drug Co.", "D.L. Gregg Hardware", "Glendale Music" and "Sun Drugs". (ca. 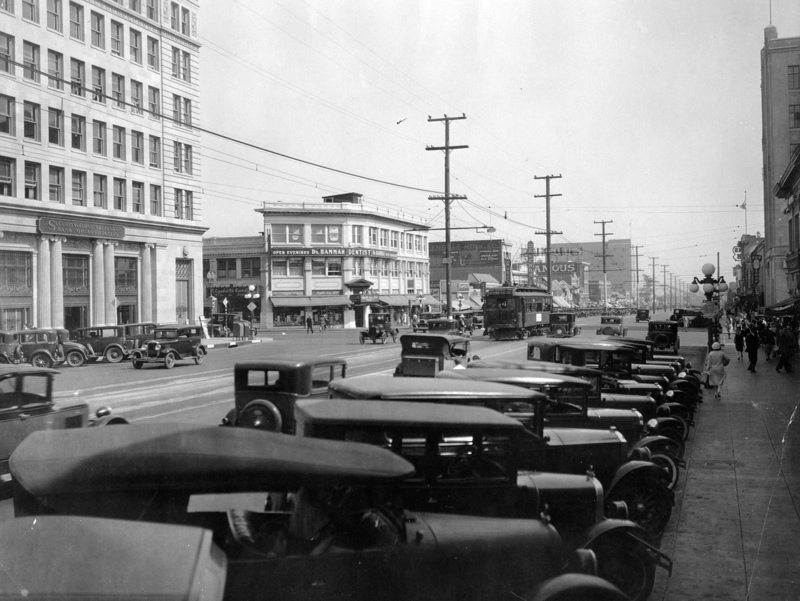 1924)^ - View looking north down the center of Brand Boulevard. 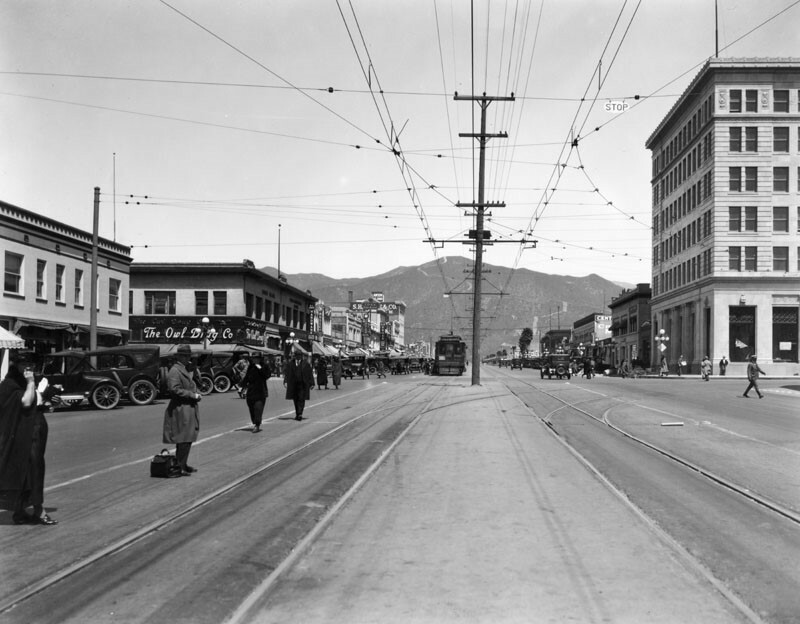 The electric streetcar tracks are running north to south with a pair of tracks going off to the right toward Broadway. There are several businesses and stores that run along both sides of the street including "The Owl Drug Co." (N/W corner of Brand and Broadway). On the right in the distance, the Alexander Theatre with its original facade is visible. With population growing from 13,756 in 1920 to 62,736 in 1930, Glendale called itself "The Fastest Growing City in America". 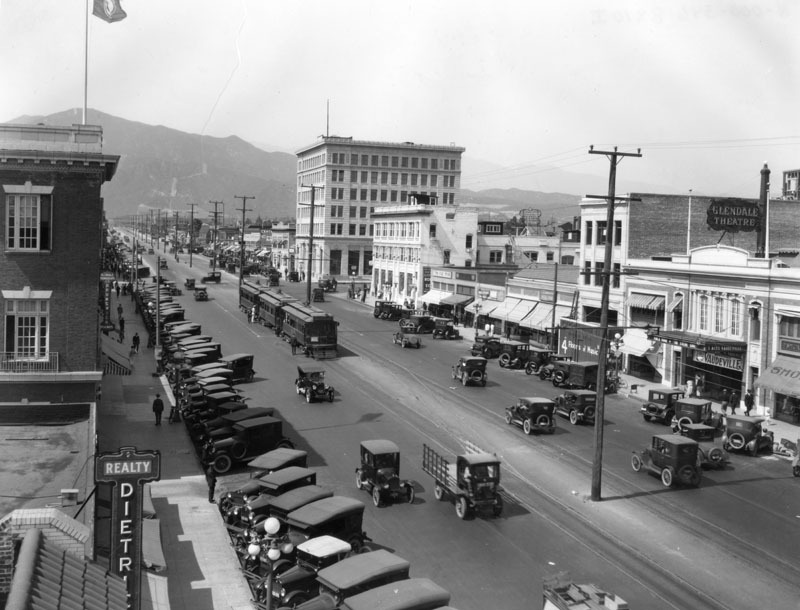 (1924)^ - View of the NE corner of Brand and Broadway in Glendale where the 1923-built Security Trust and Savings Bank stands. Note there are no street traffic lights as pedestrians and automobiles cross the streets. Many businesses may be seen on both sides of the street including railroad tracks which run down the middle of this wide street. 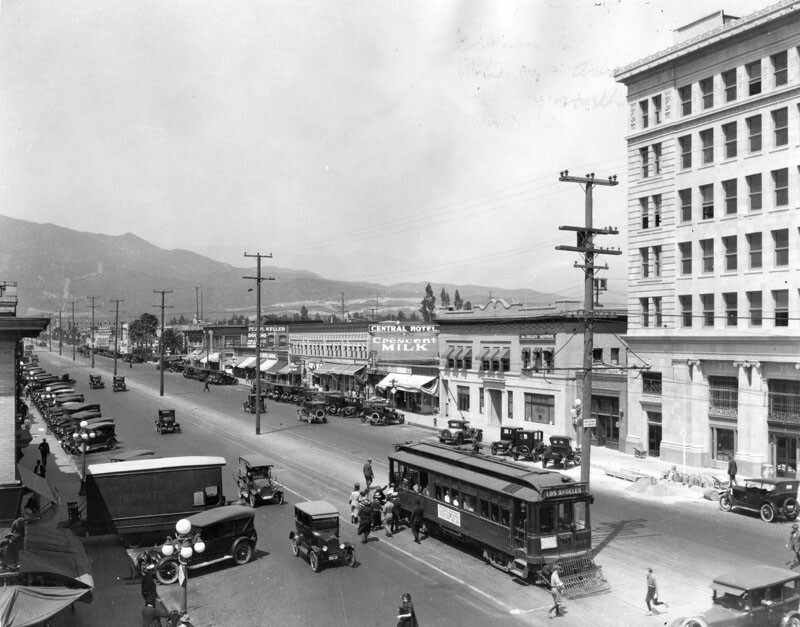 (1924)^ - View looking north on Brand Boulevard from Broadway showing passengers boarding a Pacific Electric streetcar heading toward downtown Los Angeles. (ca. 1924)^ – Postcard view looking east on Broadway at Brand Boulevard. (ca. 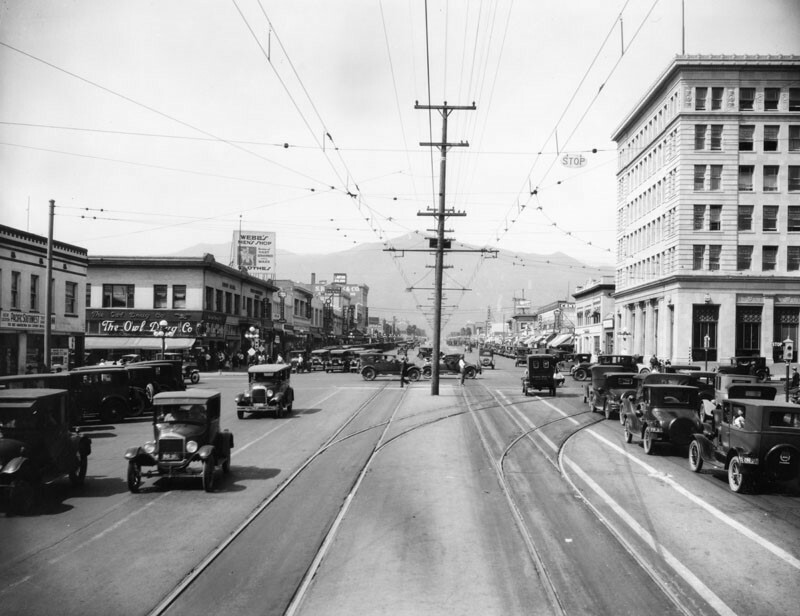 1924)^ - View looking east on Broadway from Brand Blvd. Streetcar wires are overhead, with tracks beneath. A Glendale State Bank sign is seen on the north, and a drugstore on the south. 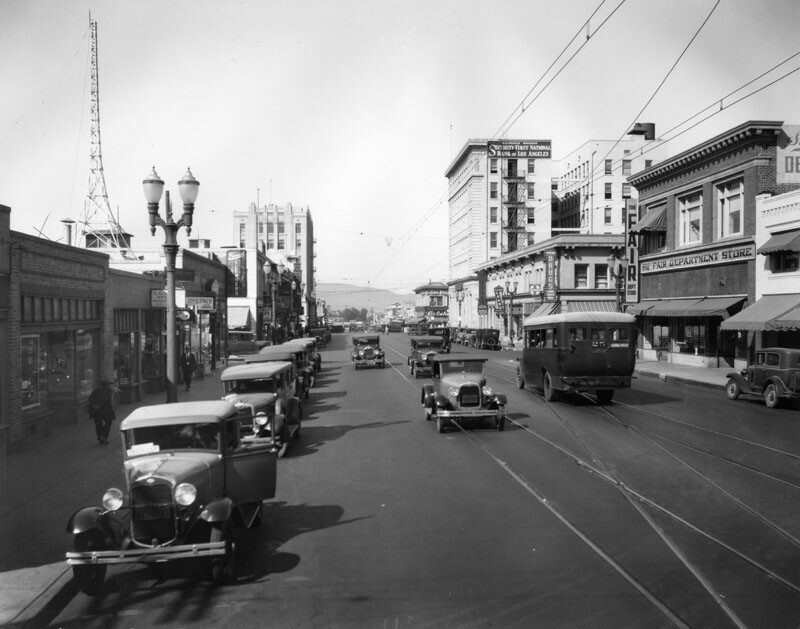 (1930)^ - View looking west on Broadway toward Brand Boulevard where the Security-First National Bank stands (previously Security Trust and Savings Bank) . The Fair Department Store is seen on the right. (ca. 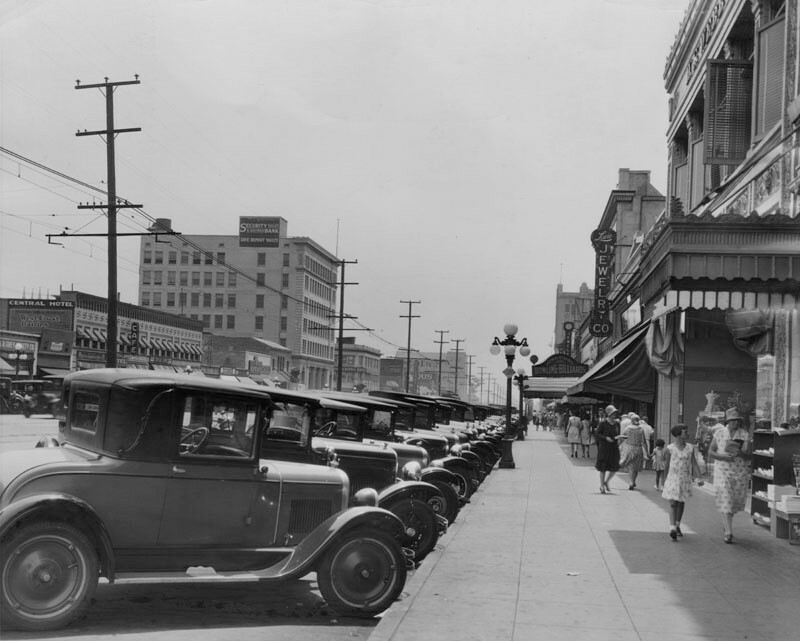 1929)^ - View looking south on Brand Boulevard at Wilson Ave. Cars parked diagonally line the street as pedestrians browse the shops. On the right, Lewis Jewelry Co. is visible mid-street, and on the opposite side of the road, the Central Hotel is seen on the corner and behind that, Security Trust & Savings Bank which would become Security-First National Bank circa 1930. (ca. 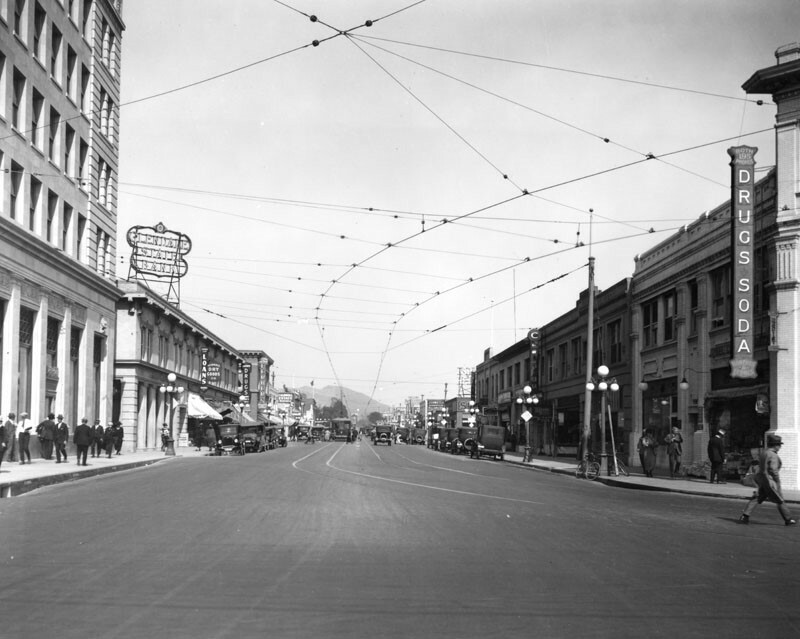 1931)^##- Downtown Glendale, looking south on Brand Boulevard toward Broadway. Security-First National Bank is on the left (originally the Security Trust and Savings Bank). (ca. 1931)^ - View looking east on Broadway at Brand Bloulevard with the Security-First National Bank building seen on the northeast corner. On the southeast corner is Dr. Hamman, Dentist. Note the STOP/GO semaphore traffic signal at lower-right. Click HERE for contemporary view. 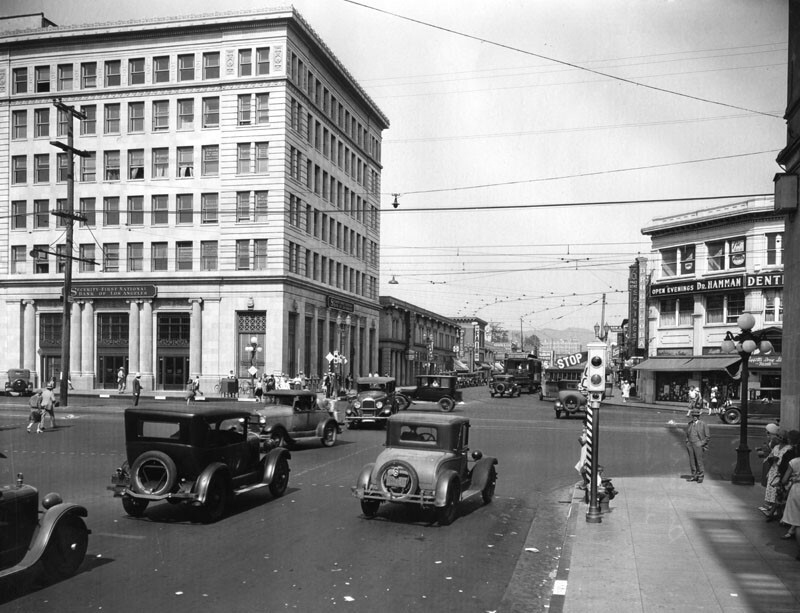 (1931)^ - View looking at the very busy intersection of Brand and Broadway with the Glendale branch of Security-First National Bank standing on the northeast corner. This was the site of the old electric railroad station. Photo date: January 9, 1931. 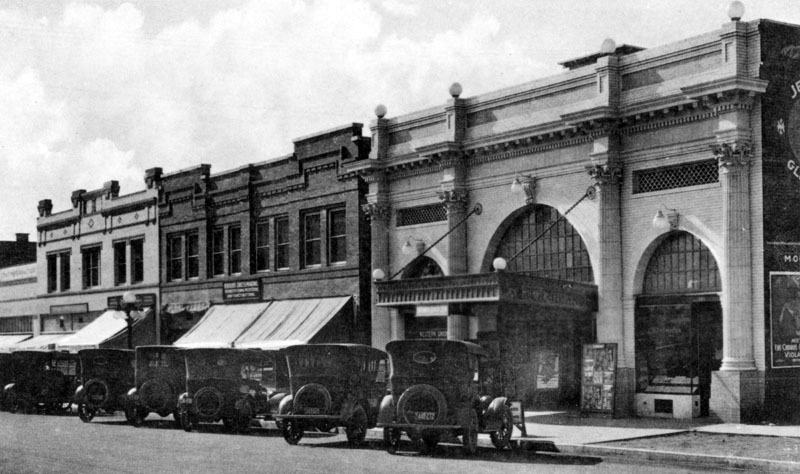 The NE corner of Brand and Broadway was the site of the Glendale depot of the Los Angeles Interurban railway, 1904-1923. 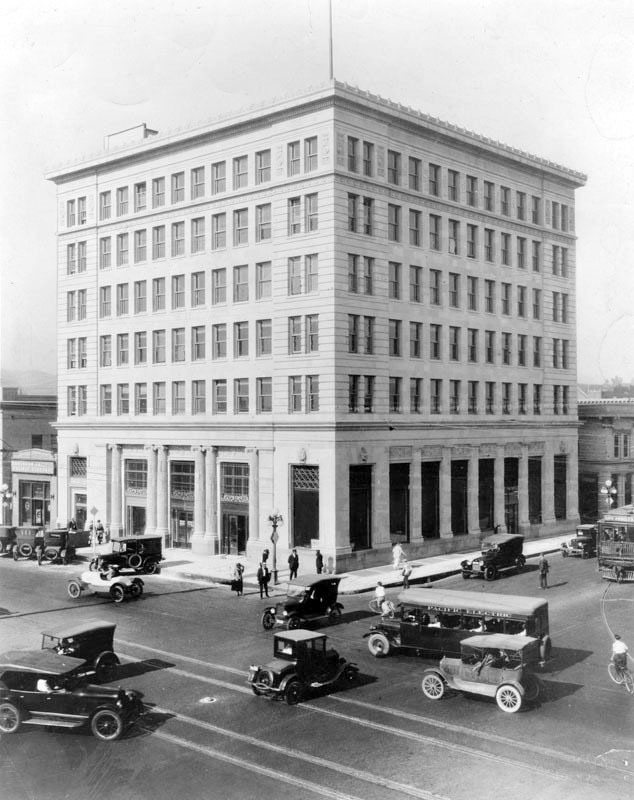 The first six-story building in the city was constructed there by Security Trust and Savings Bank in 1923. 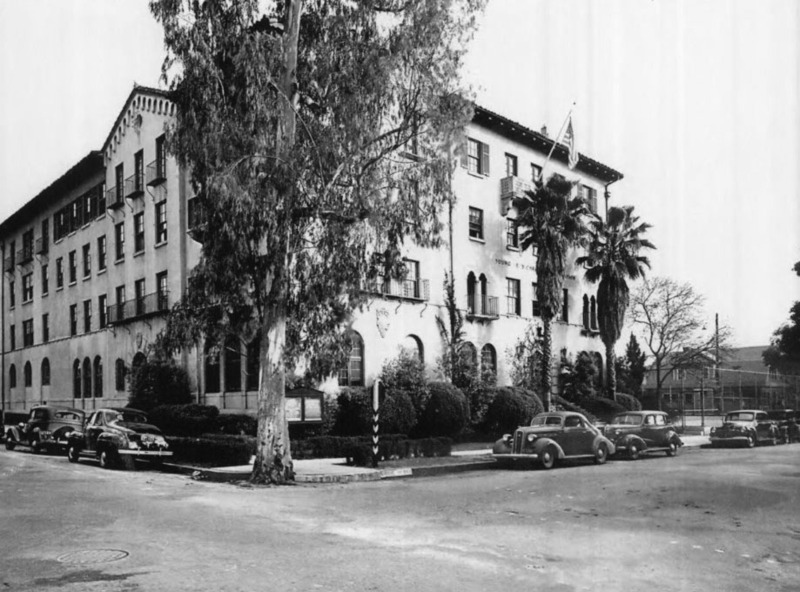 Originally, the property was occupied by First National Bank of Glendale. 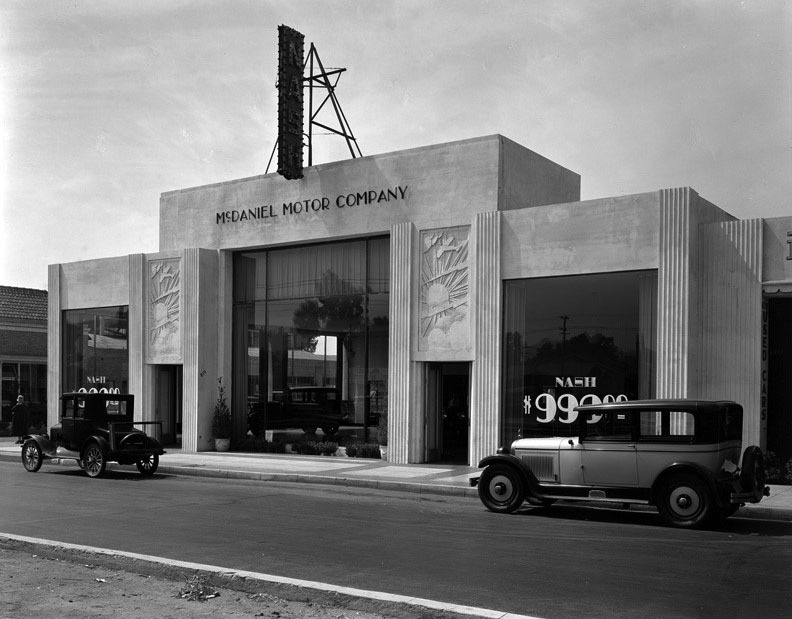 (1926)^*# – View showing the McDaniel Motor Company Builidng located at 819 Brand Boulevard, Glendale. The Art-Deco building features a showroom with large display windows and decorative facade. Architect: C. Roderick Spencer. In the years between World War I and World War II, the country entered the age of the automobile, and this Art-Deco style worked particularly well in the expanding California automotive market where dealers competed fiercely for attention and for sales. (1926)^*# - View of the McDaniel Motor Co. car dealership showing the main showroom and the attached garage bay-style Used Car Department. Advertisement for a Nash Automobile for $999.00. Nash Motors was founded in 1916 by former General Motors president Charles W. Nash who acquired the Thomas B. Jeffery Company. Jeffery's best-known automobile was the Rambler whose mass production from a plant in Kenosha, Wisconsin began in 1902. The 1917 Nash Model 671 was the first vehicle produced to bear the name of the new company's founder. 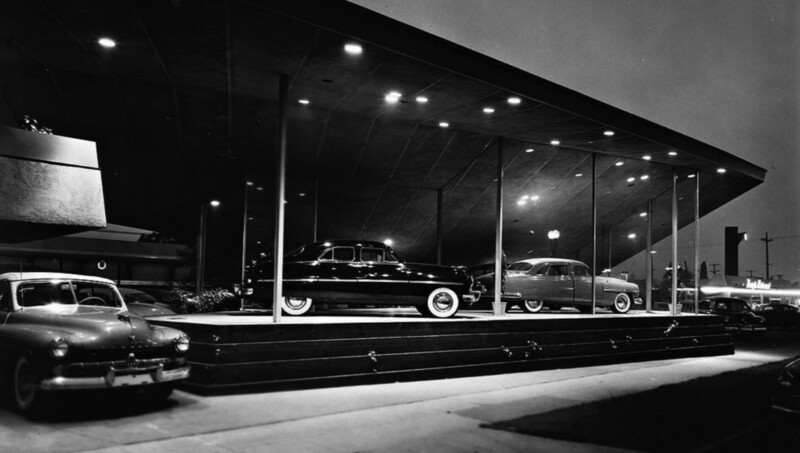 Nash enjoyed decades of success by focusing its efforts to build cars "embodying honest worth ... [at] a price level which held out possibilities of a very wide market." 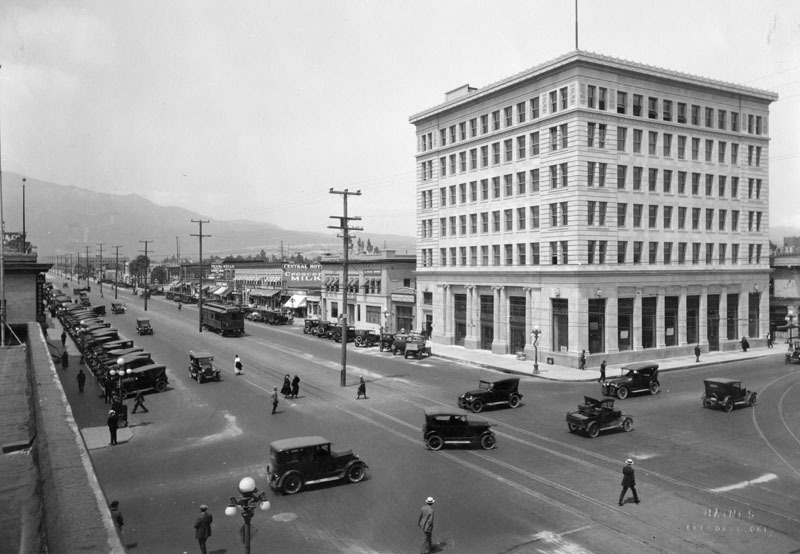 (1920s)^ - View of the Business Block on Brand Boulevard, in Glendale. The Palace Grand Theatre is seen on the right at 131 N. Brand Blvd. (ca. 1920)^ - View showing the Palace Grand Theatre located at 131 N. Brand Boulevard with a bicycle parked at the curb. (ca. 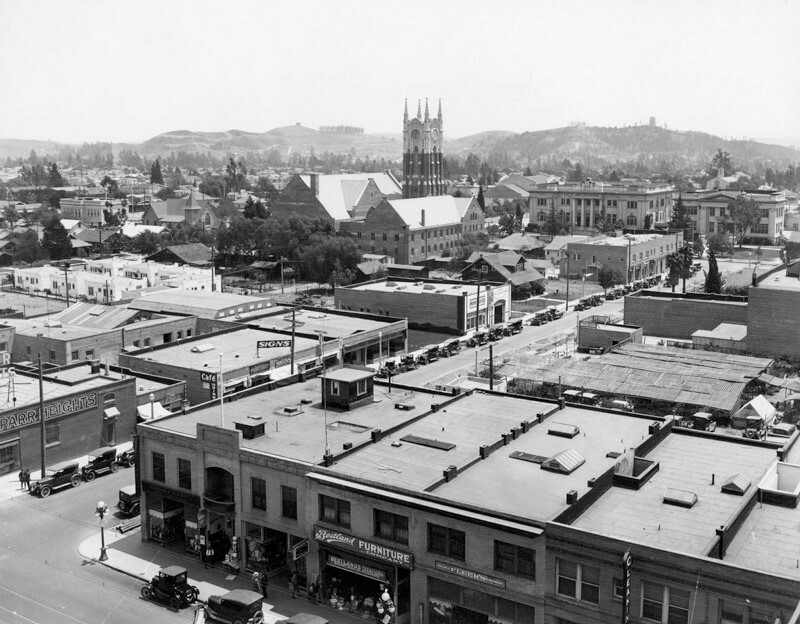 1925)^ - Panoramic view of Glendale looking northeast from the Lyons Storage building near Central Avenue and Colorado Boulevard. The Glendale Presbyterian Church with its distinctive bell-clock tower can be seen in the distance. 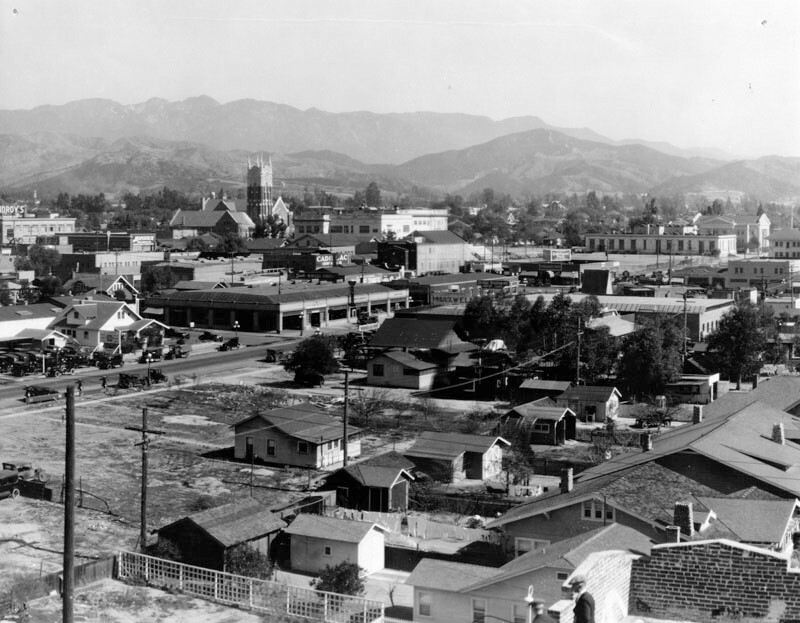 (1925)^ - Panoramic view of Glendale from Broadway and Maryland, looking southeast to Forest Lawn Cemetery with a closer view of the Glendale Presbyterian Church. To the right of the Church can be seen Glendale Union High School (built in 1908). (ca. 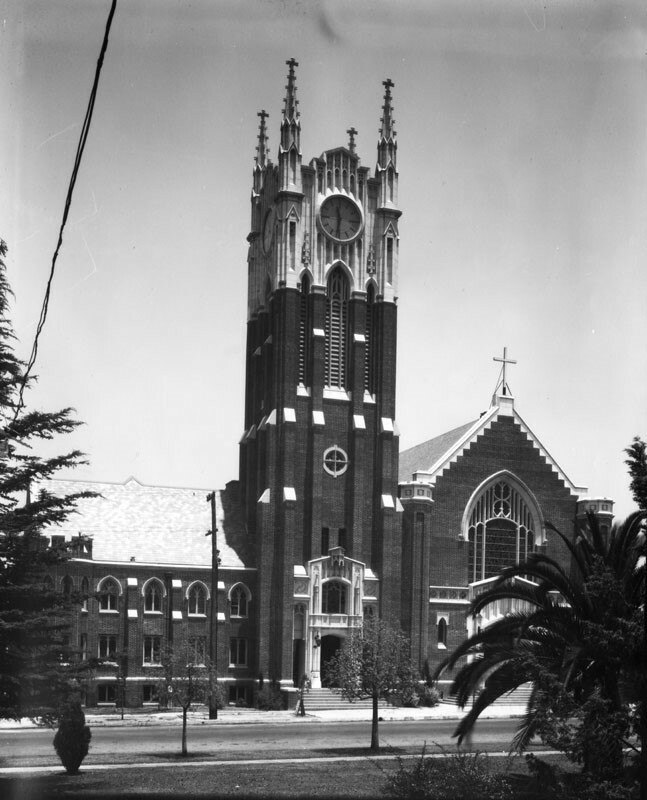 1924)^ - View of the bell tower with its clock and entrance to the Glendale Presbyterian Church located on the NW corner of Louise and Harvard streets. The church was built in 1923 in an English Gothic Revival style. (ca. 1920s)^ - Looking across Harvard Street showing the Glendale Presbyterian Church with its spires and clock tower. 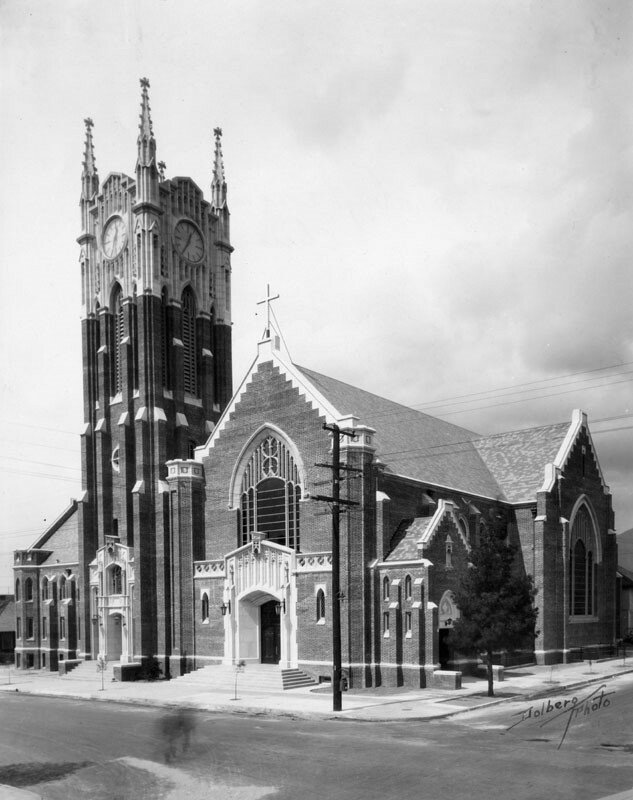 This church building no longer exists, however, the corner lot is still occupied by the Glendale Presbyterian Church. Click HERE for contemporary view. (ca. 1926)^*# – Postcard view looking at the SE corner of Wilson Avenue and Louise Street showing the newly constructed Glendale YMCA. 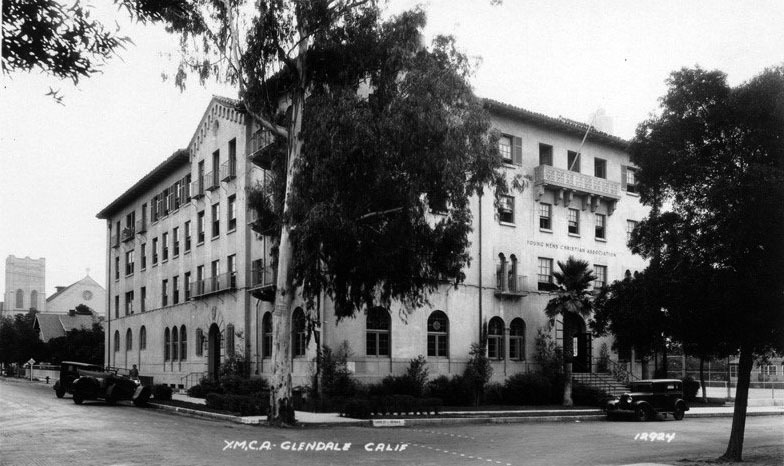 (1938)#* – View showing a large Eucalyptus tree on the corner in front of the Glendale YMCA building. The building still houses YMCA today, but the Eucalyptus tree is no longer standing. Click HERE for contemporary view. (1931)^*# – View showing the Glendale Masonic Temple, located at 232 S. Brand Blvd. The ‘Re-elect Gov. C.C. Young Headquarters’ is seen on the left. The 1920s-building was designed by Arthur Lindley, whose firm Lindley & Selkirk designed the Alex Theatre a few blocks north of the temple. 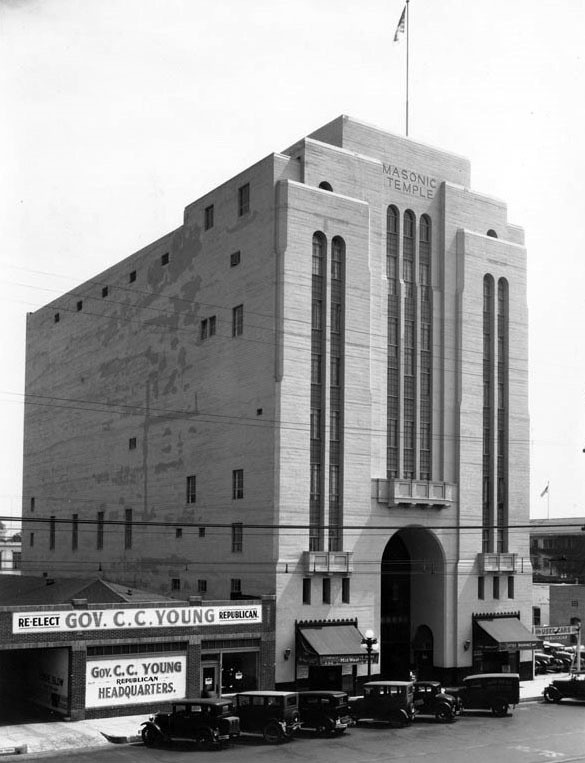 (1931)^*# - Closer view showing the entrance to the Masonic Temple on Brand. Americana at Brand owner Rick Caruso and his company, Caruso Affiliated, bought the 1920s-era Masonic temple right across the street from the Americana and renovated the building. The repurposed Art Deco building now houses the commercial real estate firm CBRE. Click HERE to see contemporary view. (ca. 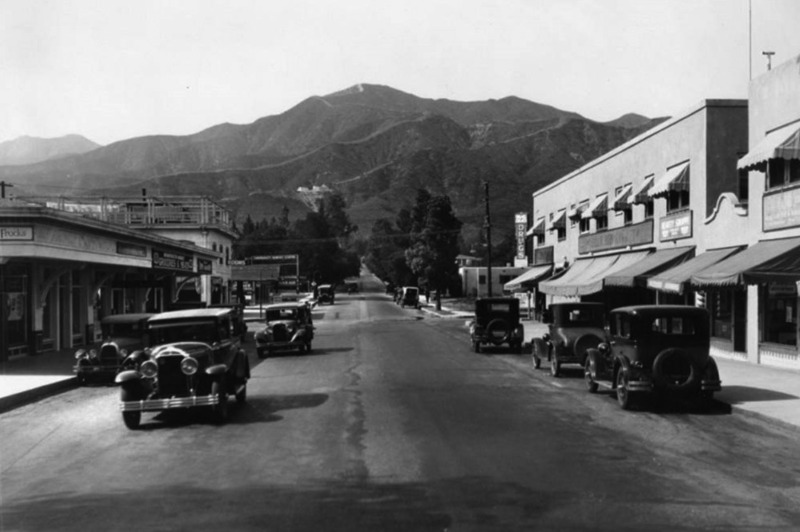 1931)^ - View looking down Brand Boulevard, in Glendale. The Lexington Hotel and Hotel California are the two large buildings across the street. The white building on the left belongs to the Glendale News-Press. The Glendale News-Press was formed when Ira Clifton Copley's Copley Press bought and combined the Glendale Daily Press and the Glendale Evening News in 1905. Copley sold the News Press and the Burbank Daily Review to Morris Newspapers in 1974; however Morris sold off the papers two years later. Ingersoll Publications bought the papers in 1980. Page Group Publishing, who had just bought the Orange Coast Daily Pilot and the Huntington Beach Independent, acquired the paper from Ingersoll in 1989. Times Mirror bought the newspaper group in 1993. (1931)^^ – View looking at west across the tracks showing the Pay'n Takit Store located at 329 North Brand Boulevard. The grocery store shared the building with Glendale News-Press. 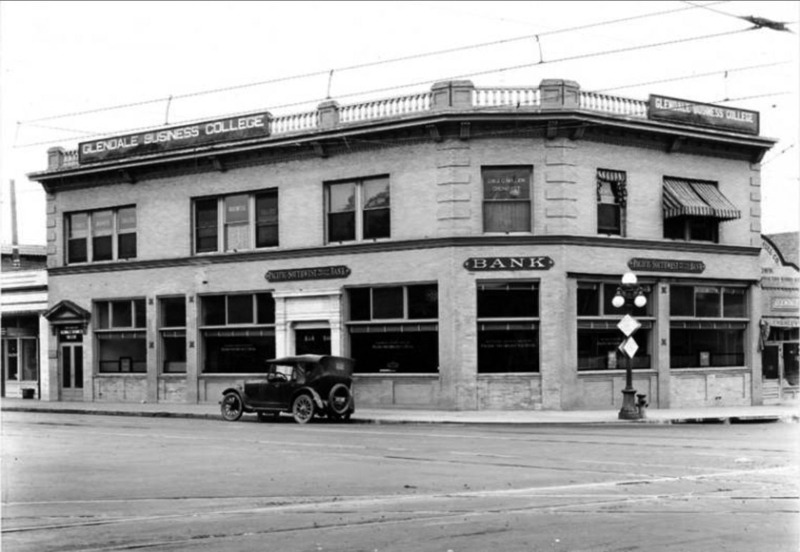 (1922)***^ – View showing the Pacific Southwest Trust and Savings Bank and the Glendale Business College, located on the southeast corner of Broadway and Crow Avenue (now Glendale Avenue). (1926)++# - View looking south on Glendale Avenue from just below Wilson Avenue. 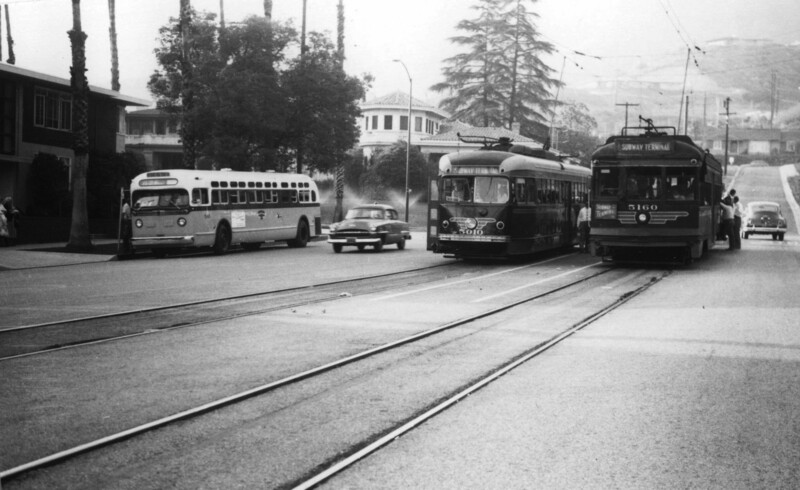 Note the Glendale & Montrose depot at right, the surviving Glendale Hotel at left and the rails curving off to the left to run in Wilson and thence to Eagle Rock. 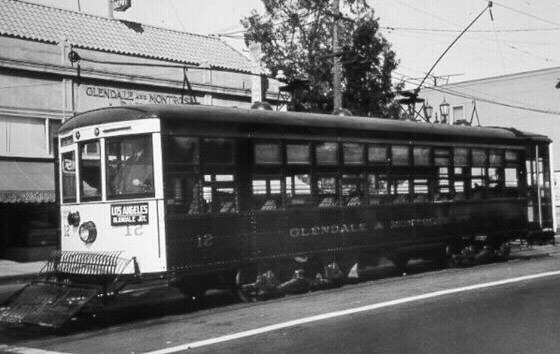 (1920s)++# – View showing the Glendale & Montrose (G&M) car No. 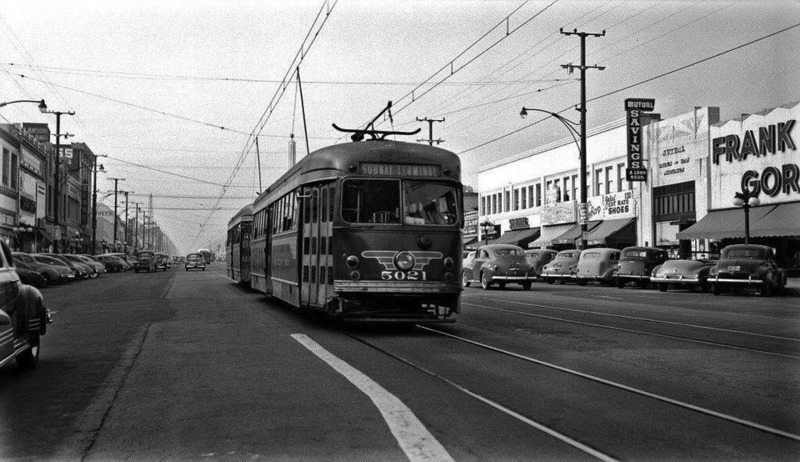 12 at the G&M depot on Glendale Ave.
(1949)#^ – View showing Pacific Electric PCC no. 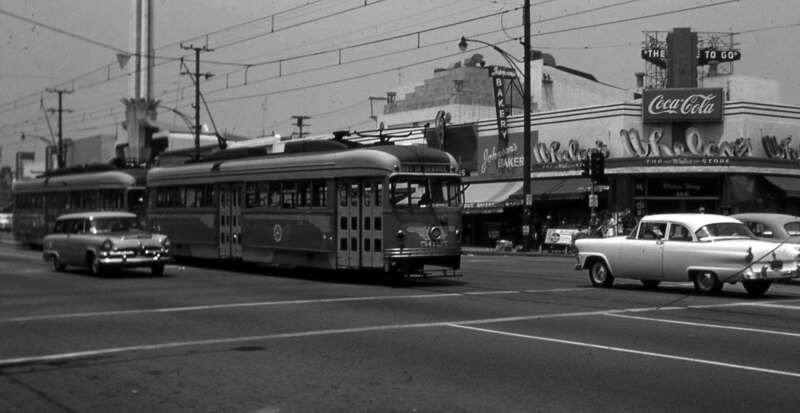 5021 rolling to a stop on Brand Boulevard at Broadway. On the right is the east side of the 100 block of N. Brand. At 114 N. Brand is "Frank Gordon" clothes. At 118 N. Brand is "Mutual Savings & Loan". (ca. 1949)^.^ – Passengers are seen boarding Pacific Electric PCC no. 5026 heading to Subway Terminal in downtown Los Angeles with a second streetcar on adjacent tracks. (ca. 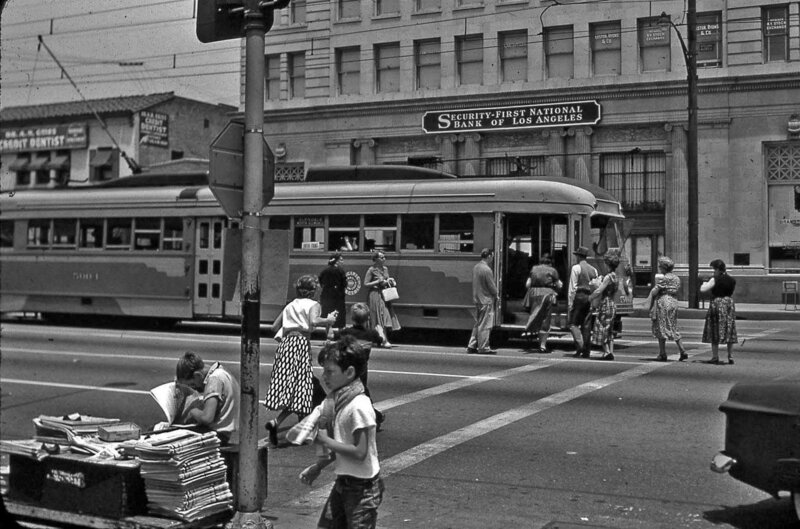 1950s)^.^ - View looking east from behind a newstand at the NW corner of Brand Boulevard and Broadway showing passengers boarding the Pacific Electric PCC with the Security-First National Bank in the background. 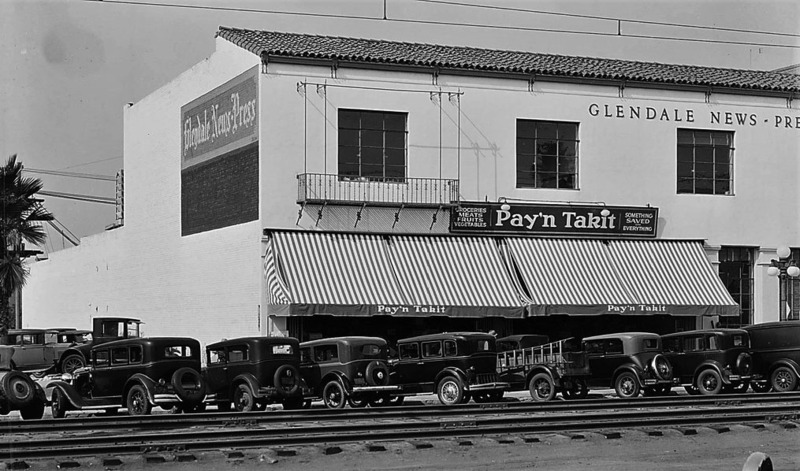 (1927)++# - View looking north from the southeast corner of Western Ave and W. Glenoaks Blvd, Glendale. A morning three-car train of PE 500-class interurbans stands ready to whisk its riders to the Subway Terminal, downtown LA. The Verdugo Mountains can be seen at right. Click HERE for contemporary view. 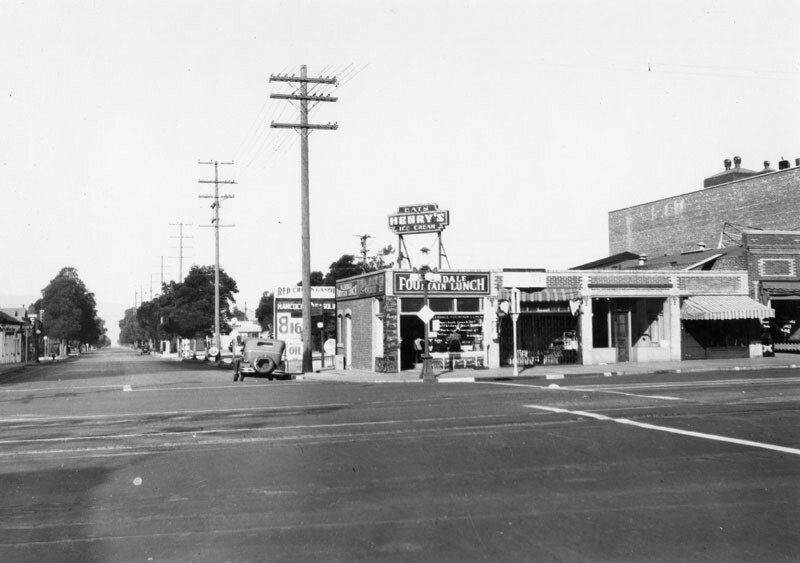 (1931)*# – Panoramic view showing the NE corner of Harvard Street and S. Glendale Ave. 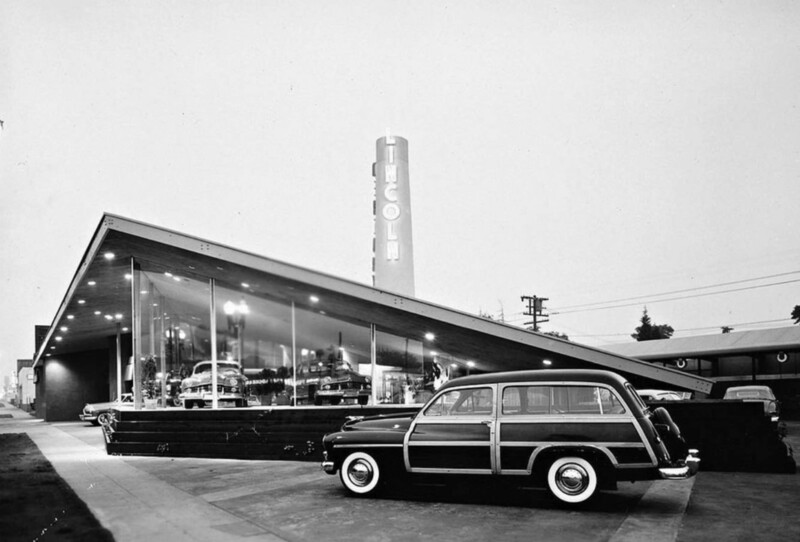 The above building is still standing today and is occupied by a Honda Dealership. Click HERE for contemporary view. 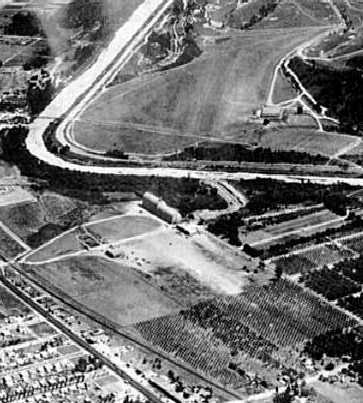 (1927)*# – Aerial view looking southeast showing the Glendale Airport field in an early configuration with a smaller border (bottom of photo). Note the peach orchard forming the northern border at lower-right. 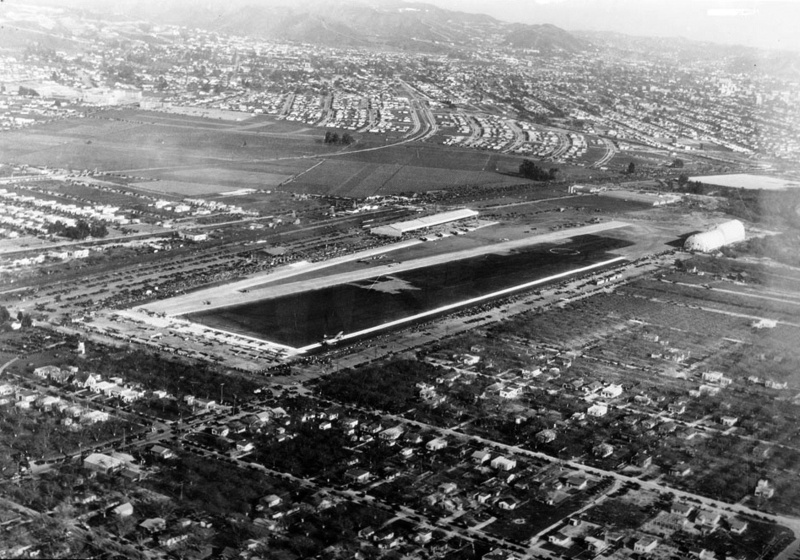 The Slate Aircraft Corporation dirigible hangar is visible on the south side of the field (center) and Griffith Park Airport is visible across the river. 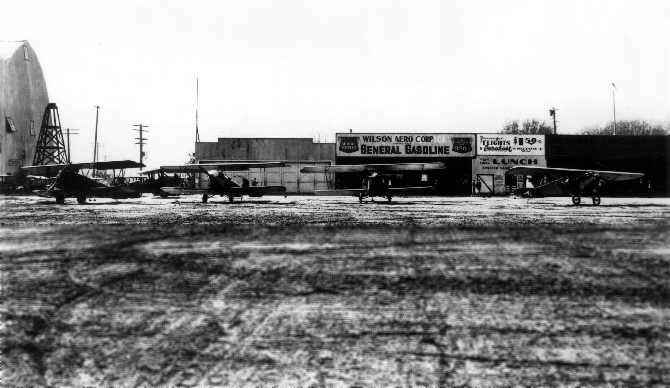 In 1922—with prompting from the Aero Club of California, returning World War I pilots and local aviation enthusiasts who wanted to get in on the exciting new world of flying—the Glendale Chamber of Commerce purchased 33 acres adjacent to the Southern Pacific Railroad tracks, directly across the river from the Griffith Airdrome. They cleared a 1,200-ft. runway for the Glendale Municipal Airport. It opened in March 1923. Soon after clearing the field, objections were raised for the City’s plans, and a bond issue was unsuccessful, so citizen supporters, led by Dr. Thomas Young, got together to form the Glendale Airport Association. 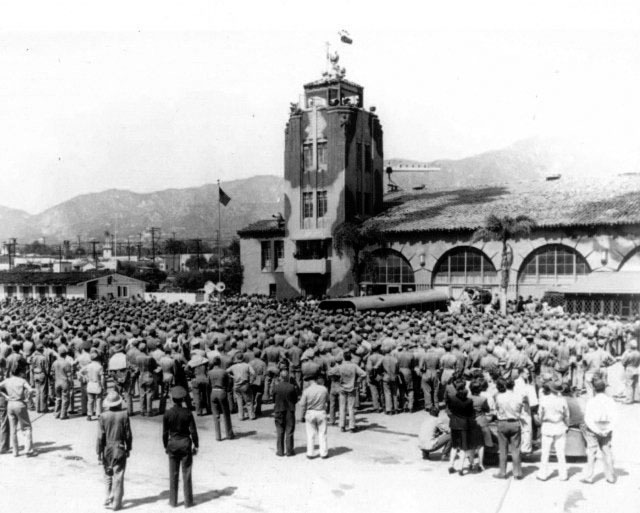 This group bought the City out, and Glendale finally had an official airport. (1927)*# – View showing three biplanes and one monoplane in front of the Wilson Aero Corporation hangar, with the Slate Aircraft Corporation dirigible hangar also visible on the left. (1929)^^ - Aerial view of Grand Central Air Terminal, Glendale, 1929. The airfield can be seen at center and a single runway is visible. Hundreds of cars can be seen parked near the runway at left, and planes are visible on the taxiways. Closely spaced houses can be seen in the foreground and in the background. (1932)^^ - Aerial view of Grand Central Airport in Glendale, February 28, 1932. The terminal is at center and is a large, rectangular, mission-style structure. A tall control tower sticks up from the upper right corner. Two small aircraft are parked directly in front of the terminal, and hundreds of automobiles are parked in a lot behind the terminal. Many people are lined up near the aircraft. The runway is at center and borders a large dirt field. In the distance at left, a neatly arranged neighborhood is visible, while railroad tracks can be seen in the foreground at right. 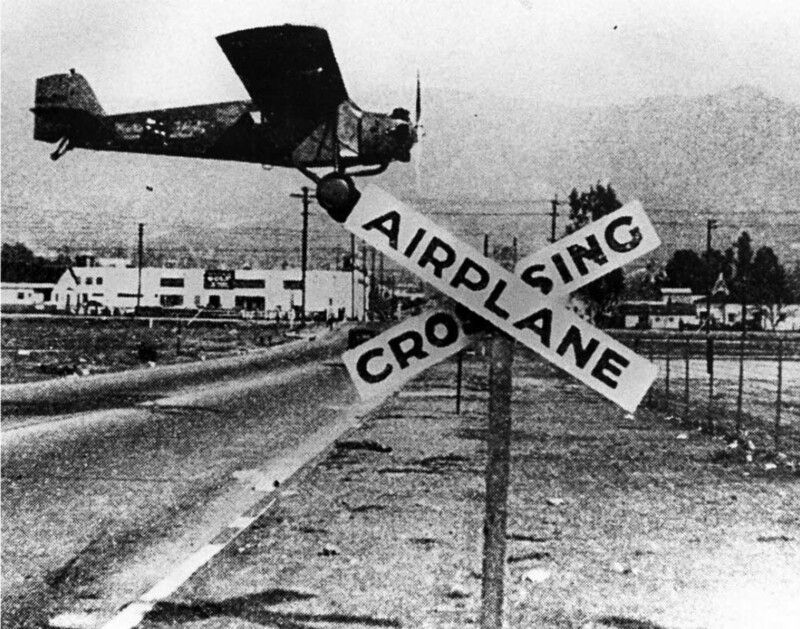 (1930)+## - Airplane Crossing sign at Grand Central Airport in Glendale. (ca. 1930)** – Postcard view showing the Administration Building at the Grand Central Airport in Glendale. A small airplane numbered NC-8413 is in front of the building. 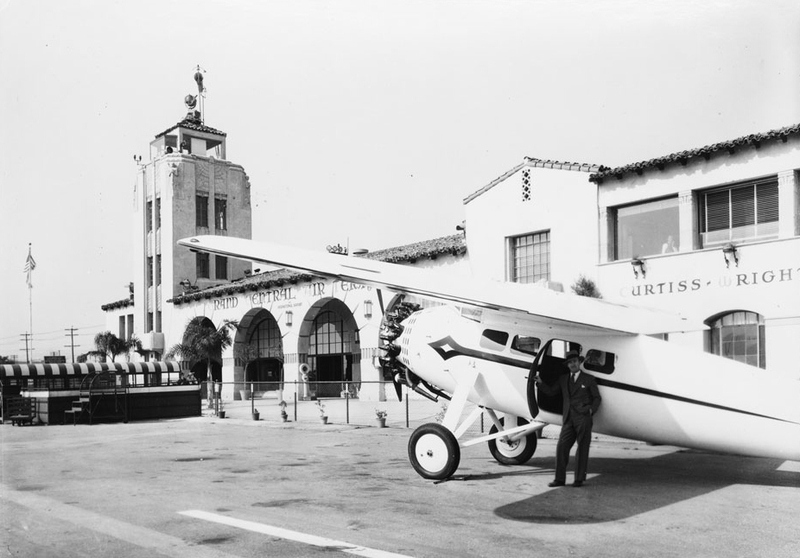 The Grand Central Airport Terminal was designed by Henry L. Gogerty in 1928 blending the Spanish Colonial Revival style with Art Deco influences. 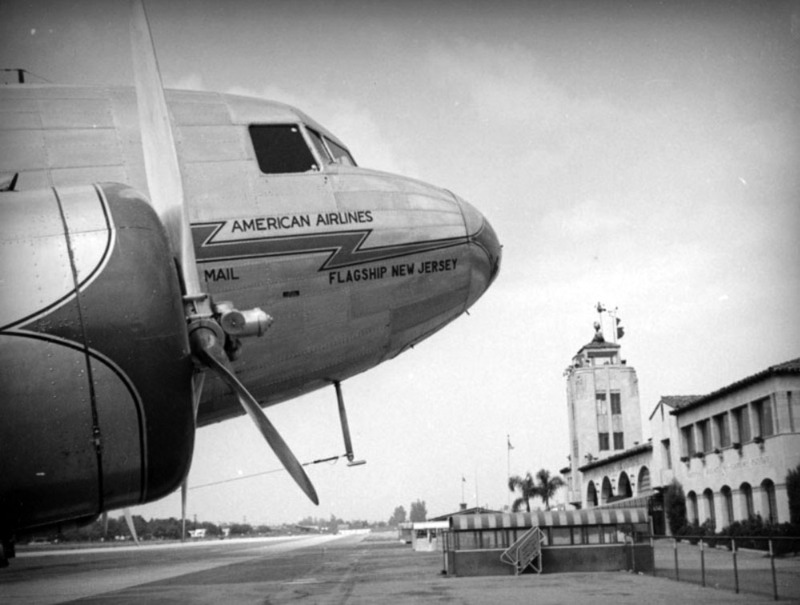 The Airport first began its service between Los Angeles and New York, and it played a vital role as the premier airport in Southern California. 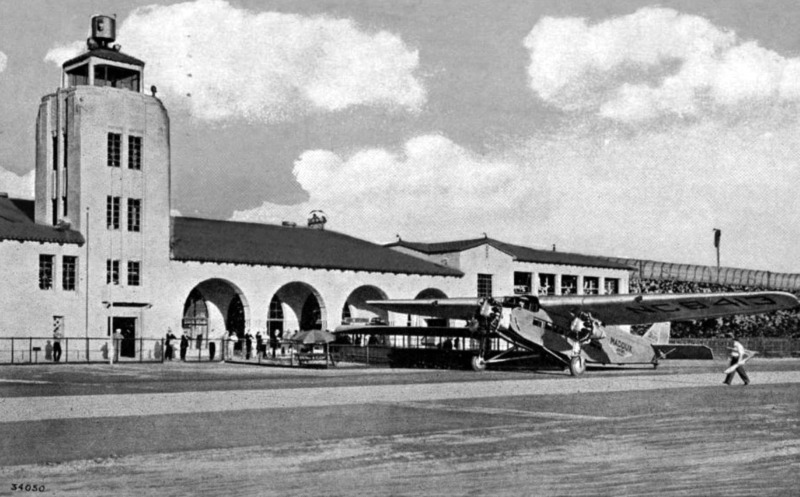 The building represents the simple concept of early airport terminal design, and it is listed on the Glendale Register of Historic Resources. (ca. 1930s)^^ - Photograph of a radial-engine airplane outside the Grand Central Airport. The high-wing monoplane can be seen in the foreground at right, and a man in a suit is visible near an open door under the wing. The Spanish-style air terminal can be seen in the background. It is a two-story structure with a terracotta tile roof. In the background at left, a tall rectangular control tower is visible. Legible signs include "Grand Central Air Terminal" and "Curtiss-Wright". (1933)^.^ – View showing the 12-passenger DC-1, Douglas Commercial Model No. 1, at Grand Central Air Terminal. The DC-1 was specifically designed for TWA. Its inaugural flight was on July 1, 1933, but it was nearly the last when both engines quit during the climb out. After modifications, the new plane met all of TWA’s requirements, most importantly of which was to be able to fly with only one of the two engines. TWA placed an immediate order for 25 Douglas airliners, but with more refinements as the DC-2. 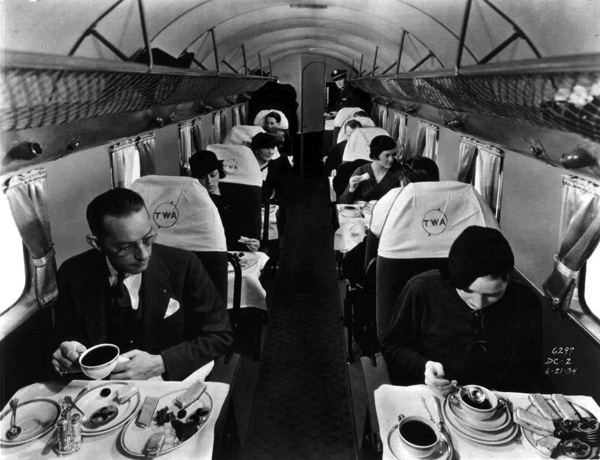 (1933)^.^ – View showing showing passengers dining in a TWA DC-2, (refined DC-1). 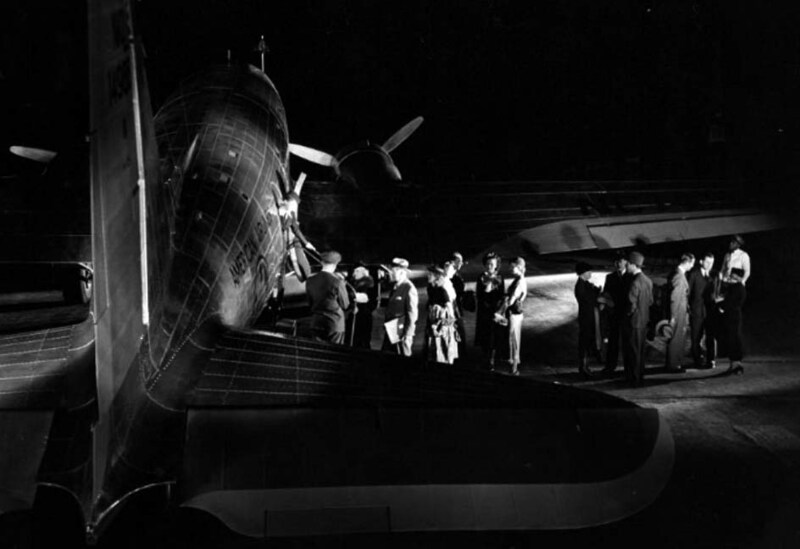 The DC-2 was increased in size with a wider diameter fuselage to allow for the taller passengers to stand in the cabin. Its length was increased by two feet to allow for an extra row of seats that increased total seating to 14. There were other improvements as well. The payload was increased, the service ceiling was increased, the speed was increased and even in-flight movies were introduced. The DC-2 was now the most luxurious airliner in the world. 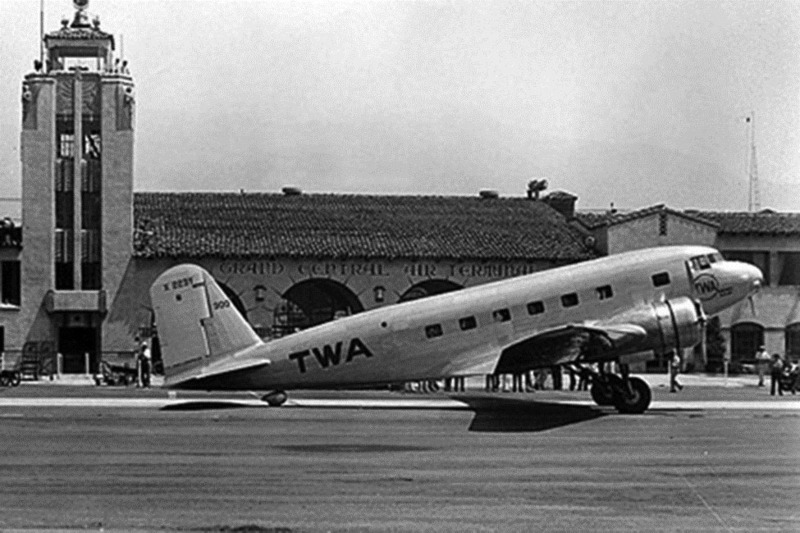 Only four months after the Model 247 entered service, the first DC-2 was handed over to TWA. It flew in record time between Los Angeles and New York. TWA advertised Coast-to-Coast service in a 200 mph luxury airliner called the Sky Chief. Transcontinental flights consisted of four legs from New York (Newark) to Chicago, Kansas City, Albuquerque and Los Angeles. Flights left at 4:00 p.m. and arrived at 7:00 a.m. the next day. (ca. 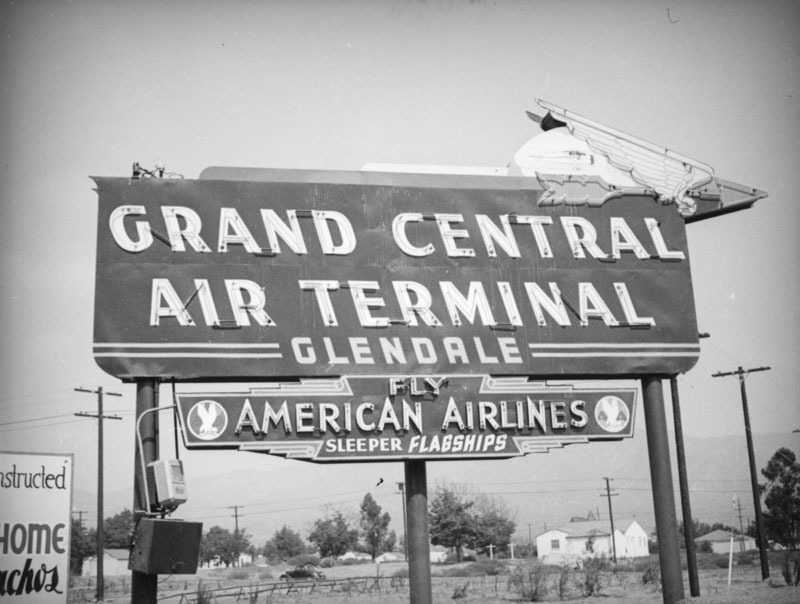 1937)^ - A wing and arrow top this neon sign for the Grand Central Air Terminal, located at 1310 Air Way in Glendale. A smaller sign hangs below encouraging one to fly the American Airlines Sleeper Flagships. A log fence and telephone lines separate the neighboring Spanish style ranch houses from the field surrounding the sign. A painted sign advertising the new development of "Ranchos" is cut off in the foreground. 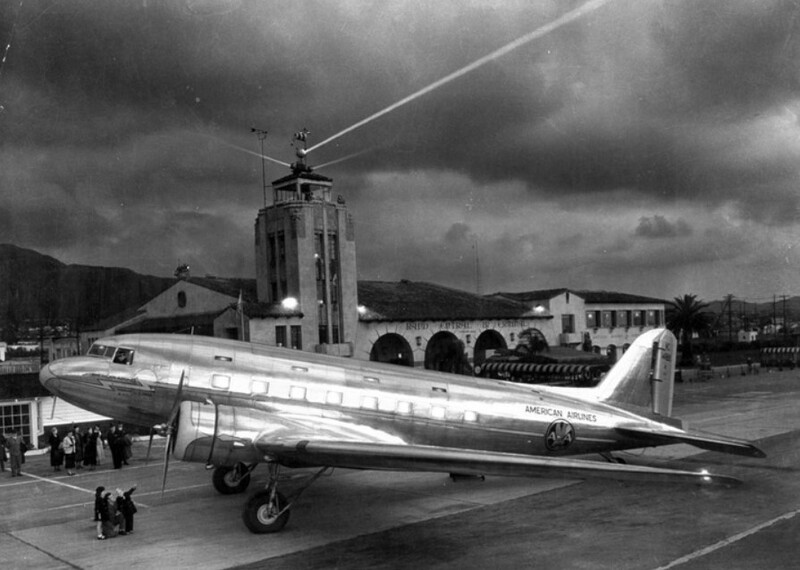 (1937)^ - View of an American Airlines DST (Douglas Sleeper Transport - an early version of a DC-3) prop plane carrying mail on the landing at the Grand Central Air Terminal, located at 1310 Air Way in Glendale. (1942)^.^ – View showing hundreds of recruits gathered to hear Air Marshall W. A. Bishop speak in front of the Grand Central Air Terminal during WWII. Note that the tower has already been painted with camouflage. When Pearl Harbor was attacked on December 7, 1941, Grand Central Airport (like all other west coast airports) was immediately closed to private aviation. (The remaining airlines had already moved to Burbank.) The government moved in, heavily camouflaged the place, and converted it into an important defense base for Los Angeles. 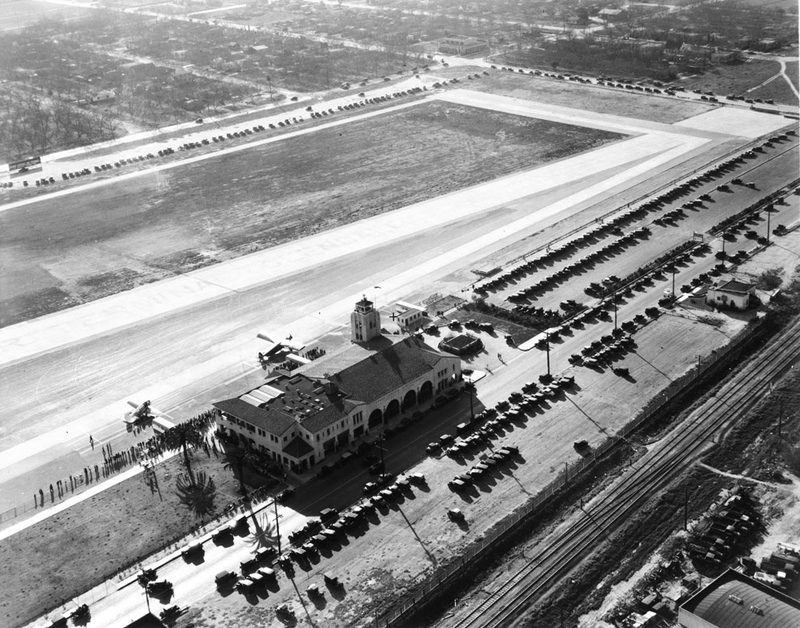 In 1942 the runway, which originally ended at Sonora Avenue, was extended North to Western Avenue, giving it a 5,000' length to accommodate large airplanes and future jet aircraft. After the war, geographic constraints hindered the airport’s ability to accommodate new—and larger—commercial aircraft. (1940s)^*^ - A shining DC-3 parked in front of the Grand Central Airport terminal as night falls. In 1947 the runway was cut back to 3,800' (southeast of Sonora Ave) due to pressure from local government. The airport was returned to private use, renamed Grand Central Airport, ceased to be profitable, and would eventually be closed in 1959. The closed airport was then used as a private heliport for the Los Angeles Police Department's fleet of police helicopters, some Bell 47's ("recips") and some Bell 206's ("Jet Rangers"), until the hew LAPD Hooper Heliport opened on top of the Piper Tech Building in downtown Los Angeles in 1983. The runways were torn out and replaced by a street named Grand Central Avenue. Over 70 new “tilt up” manufacturing buildings were constructed under the direction of the Grand Central Industrial Centre. The redeveloped airport property was eventually purchased by the Prudential Insurance Company and leased out as an investment. When Walt Disney was developing Disneyland in the early 1950s, he wanted a place away from the main studio where he could work on new ideas undisturbed. He rented an industrial building at 1401 Flower St. on the old airport property. WED (Walter E. Disney) Enterprises also rented the old terminal building during the busy years of Epcot and Disney World development. Dreamworks was created in 1994, and their new buildings soon appeared on part of the old airport land just down the street from Disney’s leased building. The Disney Corporation soon purchased the remaining land from the airport and have announced a 15-year plan to turn it into a corporate “creative campus” behind security gates. Disney has stated their intention to rework the old terminal by the year 2015 to its original look. Much of the original metal work, railings and lights have been stripped away over the years, but the Disney representative feels that their company can easily reproduce replacement pieces. (2017)#^^ - View showing the Grand Central Air Terminal as it appears today. The Grand Central Air Terminal remained untouched until 2012, when its current owner embarked on a project to transform the airport for new uses. The project team rehabilitated the entire property, including the airport concourse, runway, and taxiway. They completely restored the building’s exterior and significant interior spaces. The team thoroughly researched and meticulously restored, or recreated, missing or degraded character-defining features, such as light fixtures and decorative tile. Parts of the building were adapted into an event center and a business office for use by current tenants. The airport concourse, runway, and taxiway now serve as event space. To build awareness of the site’s history and preservation, the team created a visitor center featuring photographs, original artifacts, and an educational film. The site was designated a Glendale Historical Landmark in 1977, and it is eligible for the California Register of Historical Resources and the National Register of Historic Places. The rehabilitation project earned a Los Angeles Conservancy Preservation Award in 2017. (ca. 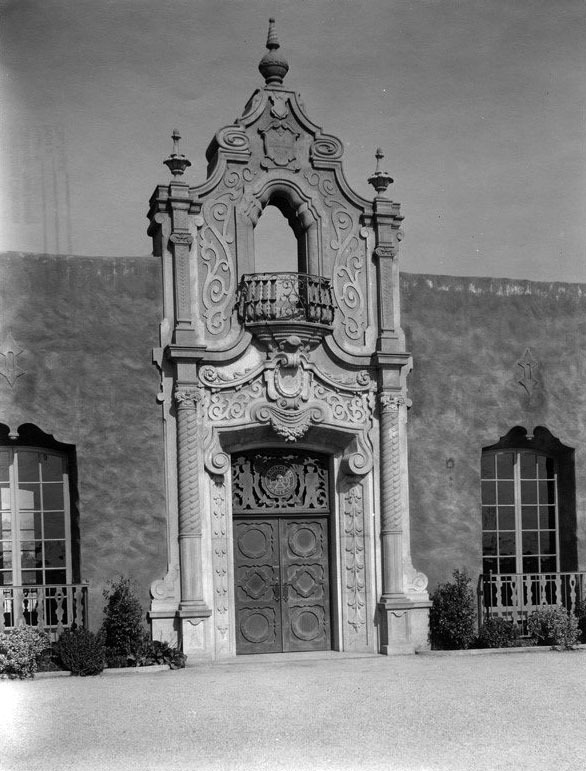 1923)^*# - Close-up view of the Mission Revival Style entrance to the Glendale Train Station. (ca. 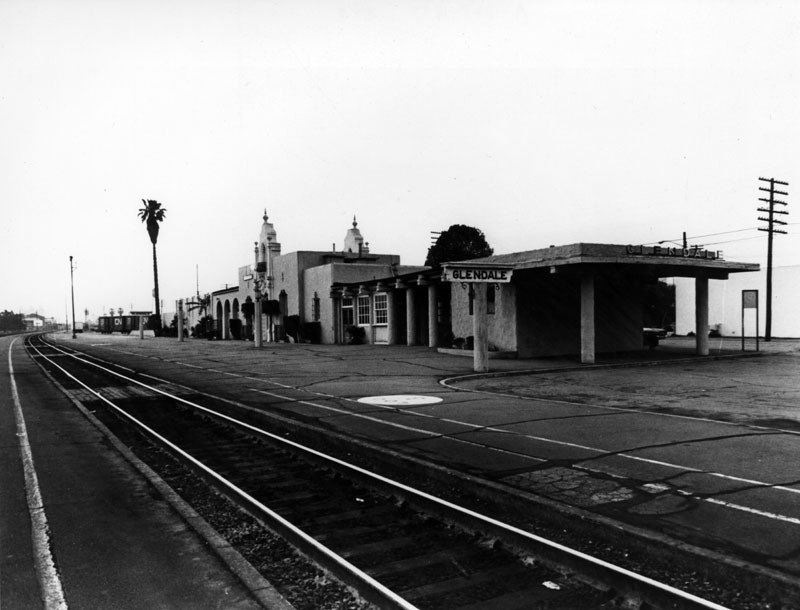 1960s)^ - Exterior view of the surprisingly empty railroad station at Glendale. This is the "back" portion of the station, where travelers wait for their trains to arrive and/or depart. Two stationary freight cars can be seen at the rear of the building. (ca. 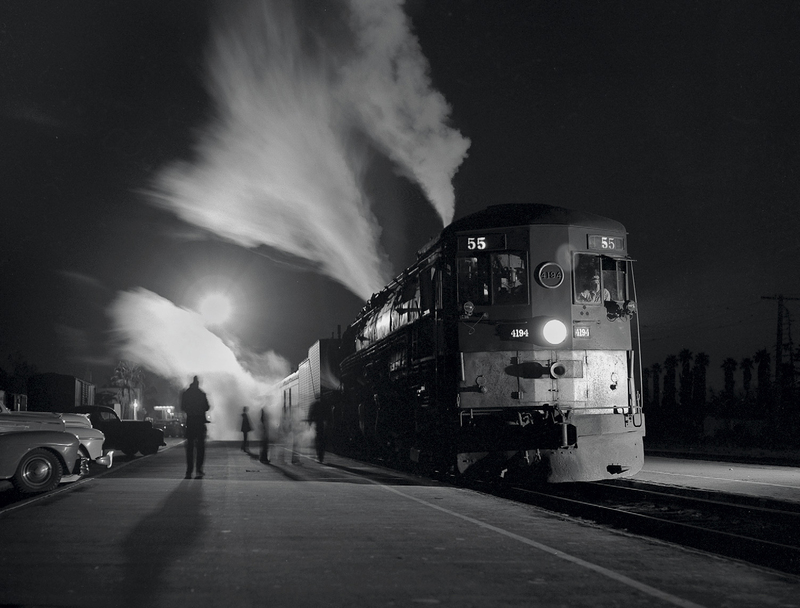 1950)^^^ - Southern Pacific #4194 ‘Tehachapi’ Night Train 55 at the Glendale Station. Photo by Richard Steinheimer. (ca. 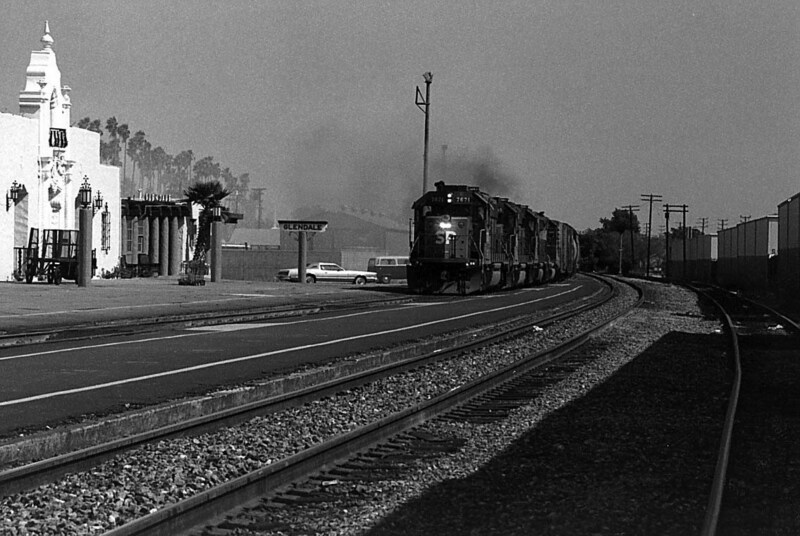 1980s)*** – View showing a train coming into the Glendale Southern Pacific Railroad Depot. 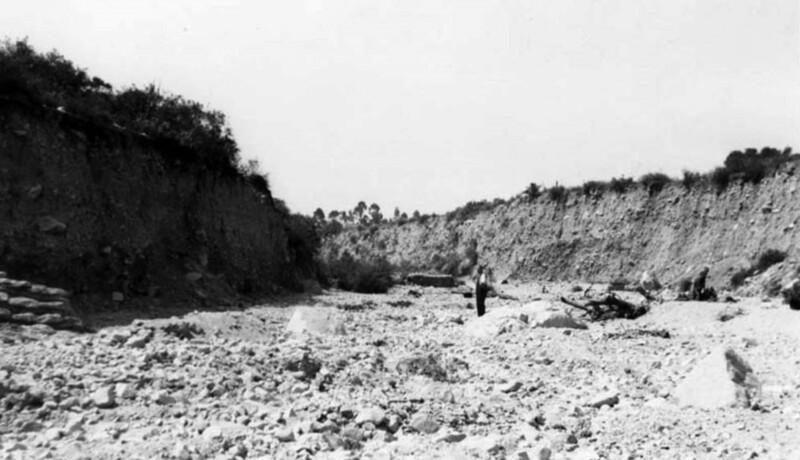 (1934)##^ - A man is seen standing in the Verdugo Wash after the 1934 flood. 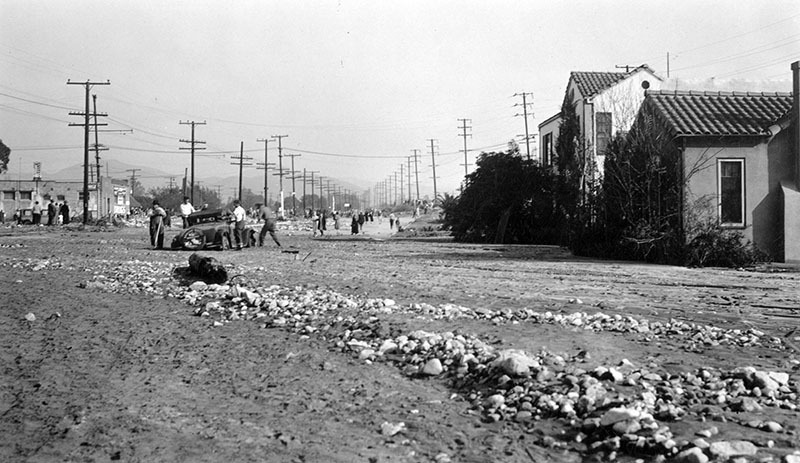 (1934)^ - An unidentified and mud-covered street in Glendale, captured after the flood of January 1, 1934. Men look at a severely damaged car, not far from homes (right), while other people are seen assessing other damage further down the street. 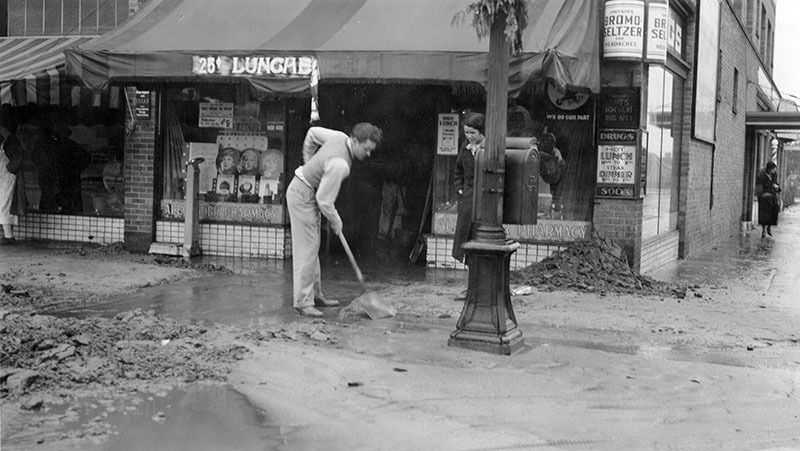 (1934)^ - A young woman watches a man shovel mud off the sidewalk outside of Alexander Pharmacy, located at 251 N. Brand Boulevard in Glendale, after the flood on January 1, 1934. This commercial building is still standing, but its façade has been greatly modified. Click HERE for contemporary view. E.C. Eaton, the County Flood Control District’s chief engineer at the time, estimated that 600,000 cubic yards of debris came down in just 20 minutes. He called for the completion of a flood-control system. 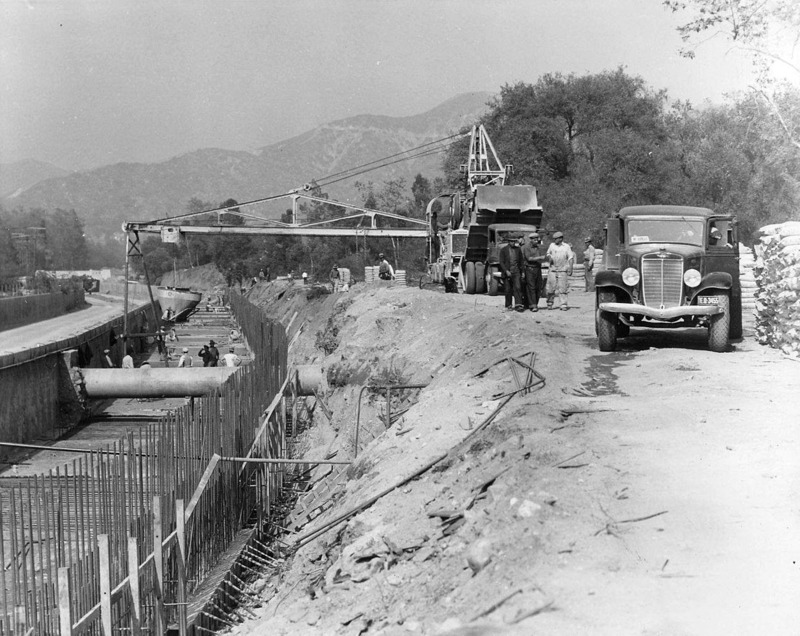 A federal Flood Control Act was signed in 1936, and the Verdugo Flood Control Project came into being. 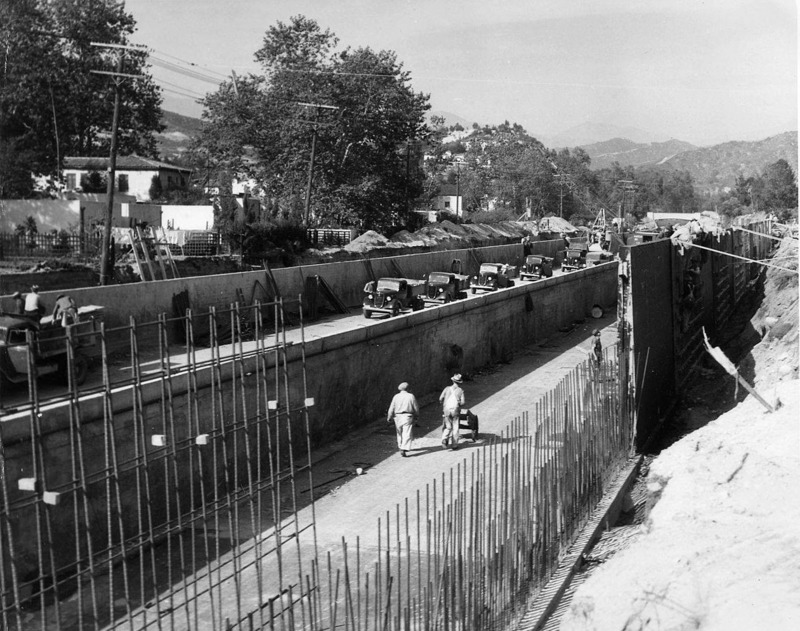 (1936)*^ - View showing the construction of the new concrete-lined Verdugo Wash storm drain looking north between Glenoaks Blvd. and Royal Blvd. (1936)*^ - View looking up the channel from the section between Glenoaks Blvd. and Royal Blvd. showing concrete mixer placing floor of storm drain for one side channel. 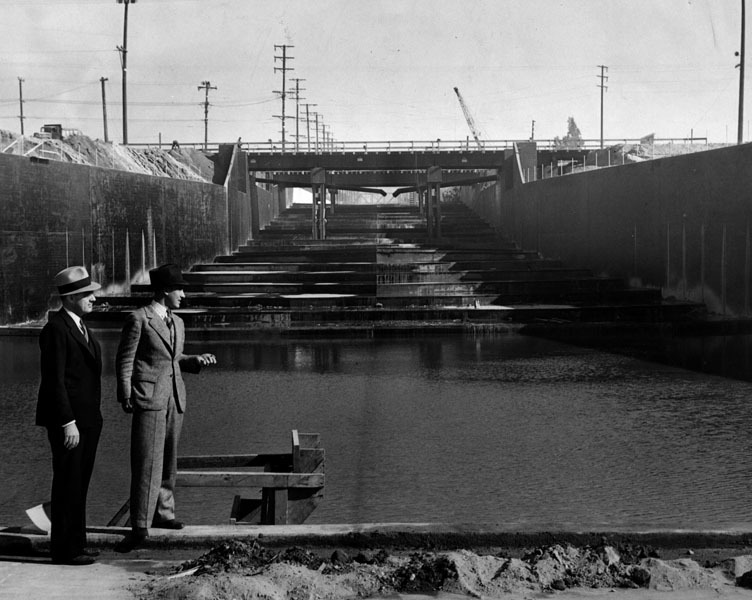 (1938)^ - View showing two men inspecting the spilling basin of the new Verdugo Wash.
Photo caption reads: “Capt. Lyle Rosenberg (left), and Lieut. F. E. Ressegieu inspecting the completed basin. Waters from the wash will spill down the concrete and steel stairs (background), and then into the basin in the foreground. A 10-foot concrete wall will cut the water's speed before it goes into the riverbed, lessening the flood hazards.” Photo dated: December 2, 1938. 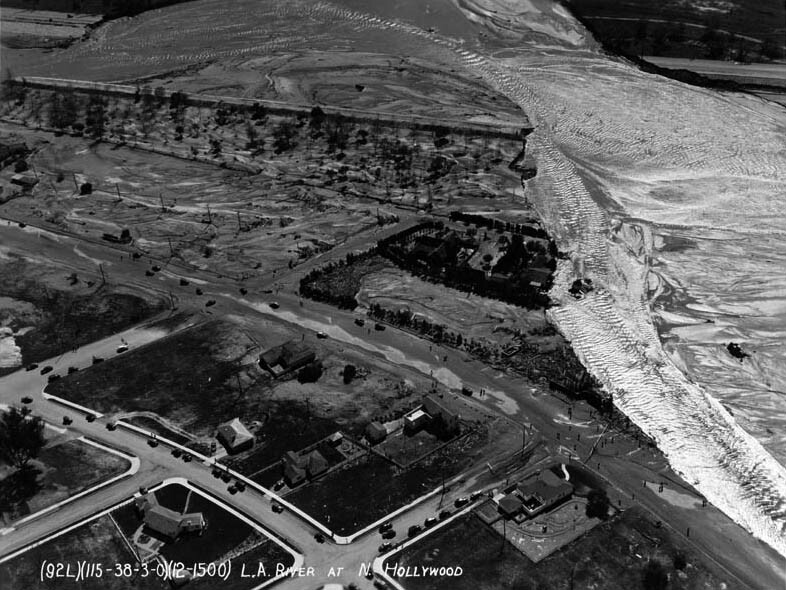 (1938)^*# - Aerial view showing the devastation when the LA River overflowed its banks. The above photo is labeled “North Hollywood,” but the area shown is actually the southwestern portion of Glendale. 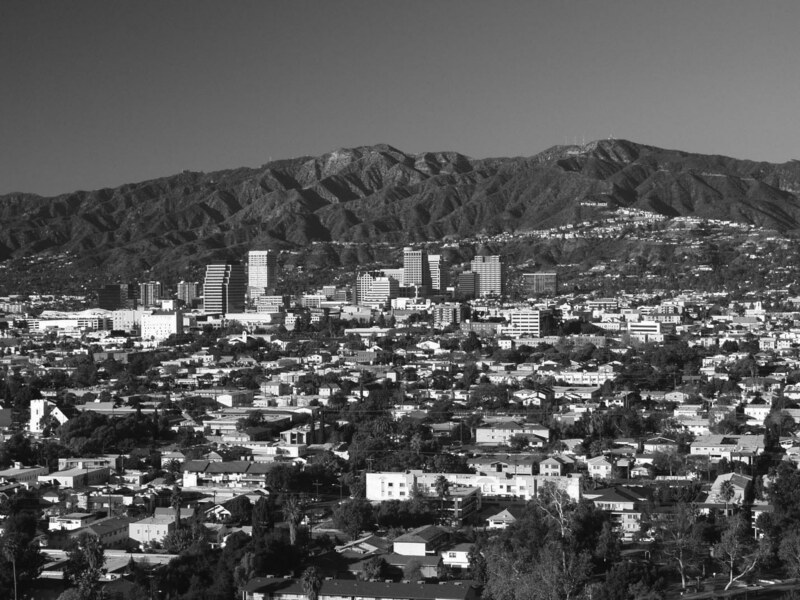 This is the area where Glendale, Burbank, and the City of Los Angeles all come together. Riverside Drive runs from center-left to lower-right corner. The street that ends at the river is Western Avenue. The large estate surrounded by trees (center of photo) was the Betty Davis “country” estate (she did not live there but she did keep her horses there, entertained, etc. ); her house and many of the trees are still in place today. Click HERE for contemporary aerial view. Between February 27 and 28, 1938, a storm from the Pacific Ocean moved inland into the Los Angeles Basin, running eastward into the San Gabriel Mountains. The area received almost constant rain totaling 4.4 inches from February 27-March 1. This caused minor flooding that affected only a few buildings in isolated canyons and some low-lying areas along rivers. Fifteen hours later on March 1, at approximately 8:45 PM, a second storm hit the area, creating gale-force winds along the coast and pouring down even more rain. The storm brought rainfall totals to 10 inches in the lowlands and upwards of 32 inches in the mountains. When the storm ended on March 3, the resulting damage was huge -- 115 lives were lost. 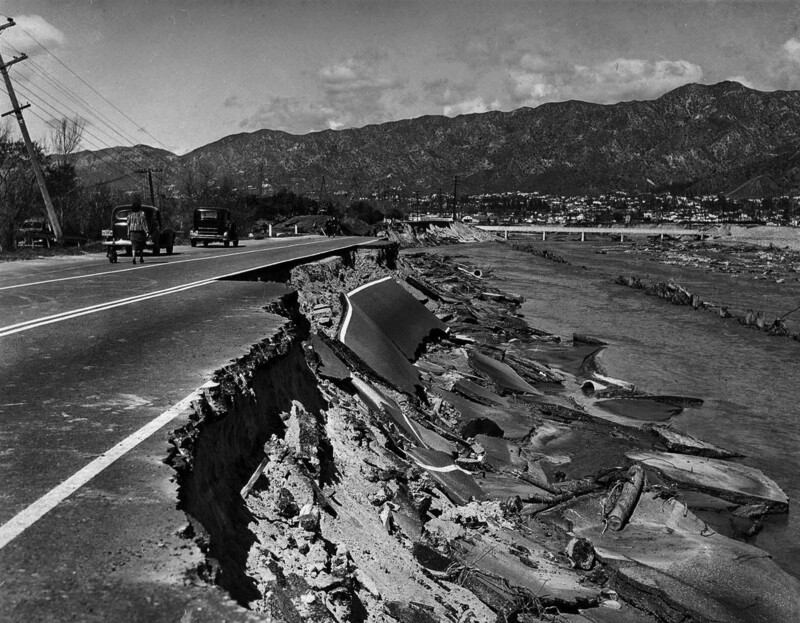 (1938)#+ - Heavily traveled Riverside Drive in Glendale was undermined by the torrent of the Los Angeles River. This damaged section was near the former Grand Central Airport. Photo date: March 5, 1938. (1938)##^ - Radio telephone in patrol cars. Chief V. B. Brown gives a demonstration of the first two-way radio telephone in the Glendale Police Department's patrol cars. The motorcycle officer is Wes Owen. The call letters KQCI became the identifier of the Glendale Police Department radio telephone. 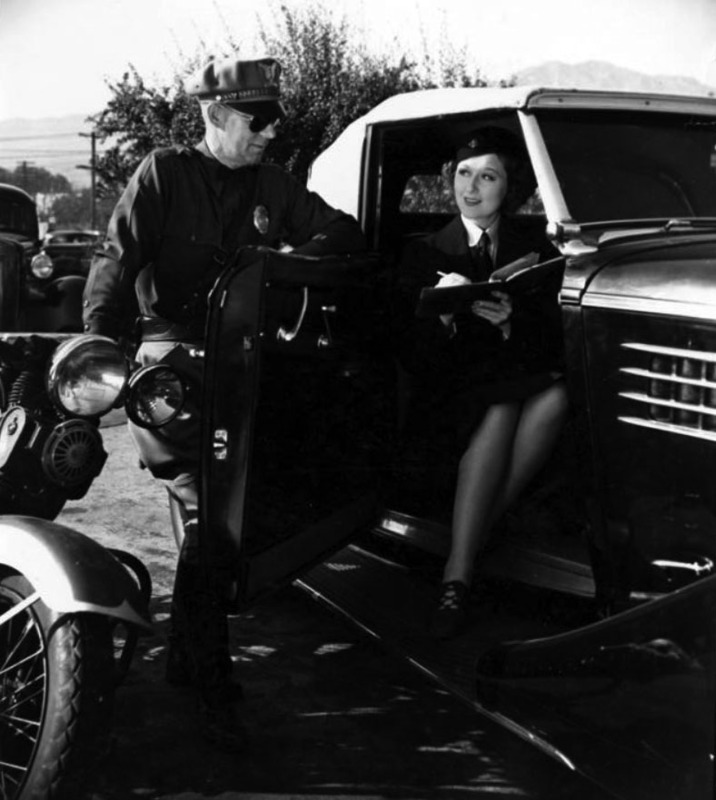 (1930s)##^ - A meter maid and a motorcycle officer for the Glendale Police Department. (ca. 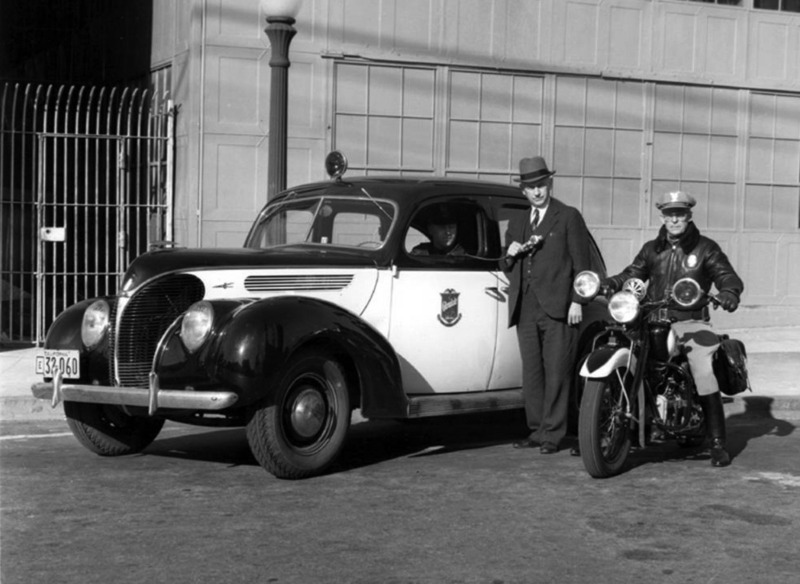 1940)##^ - Glendale Police Department Officer I. 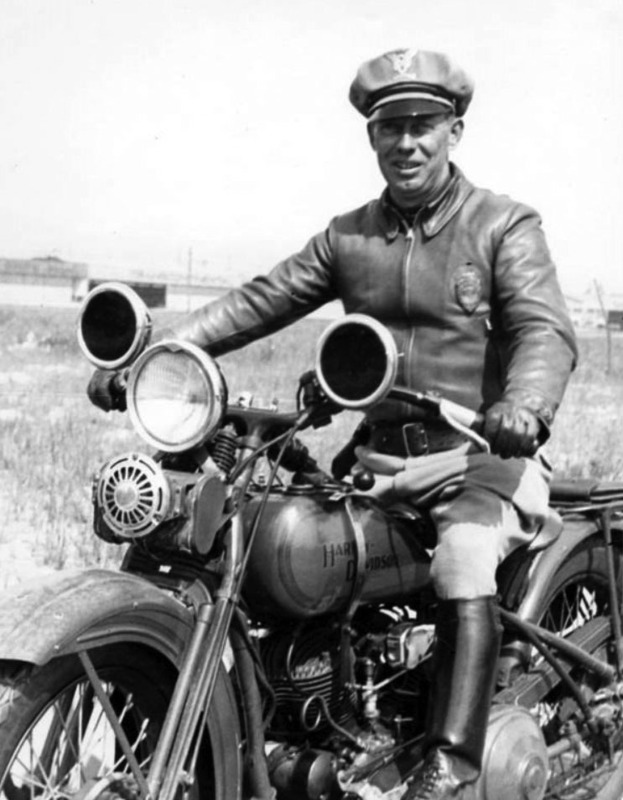 A. Robinson on an official-issue Harley Davidson motorcycle. (ca. 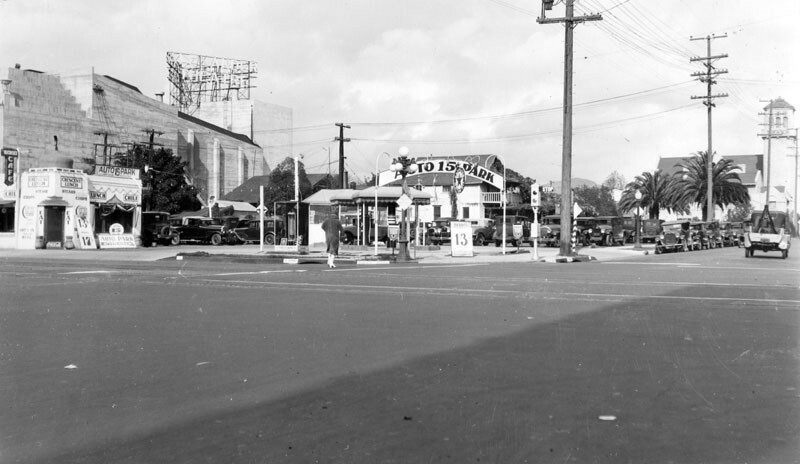 1938)^ - View showing Carpenter's Drive-in Restaurant located at 606 E. Colorado St. in Glendale. The drive-in featured fried chicken, sandwiches, year round fresh fruit pies, breakfast, hamburgers and fountain service. The Rite Spot Cafe pylon is seen in the background. 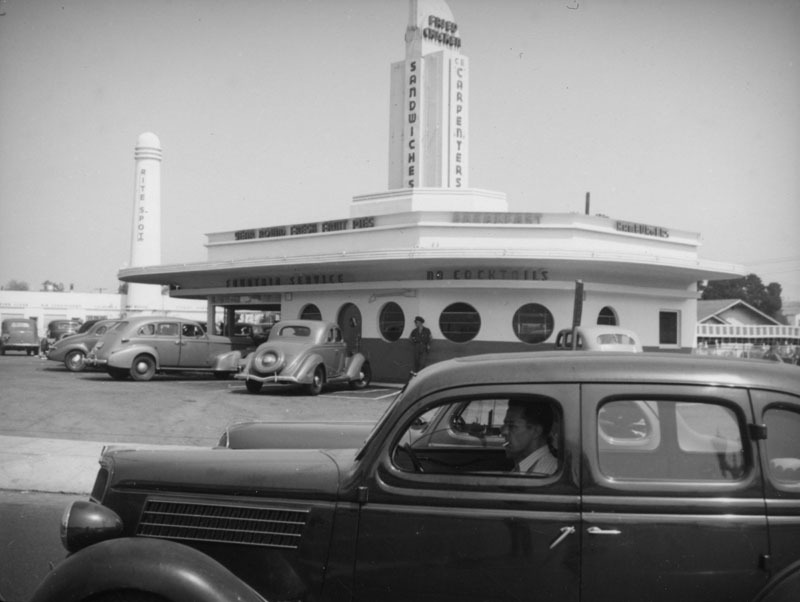 Click HERE to see more Early LA Drive-in Restaurants. 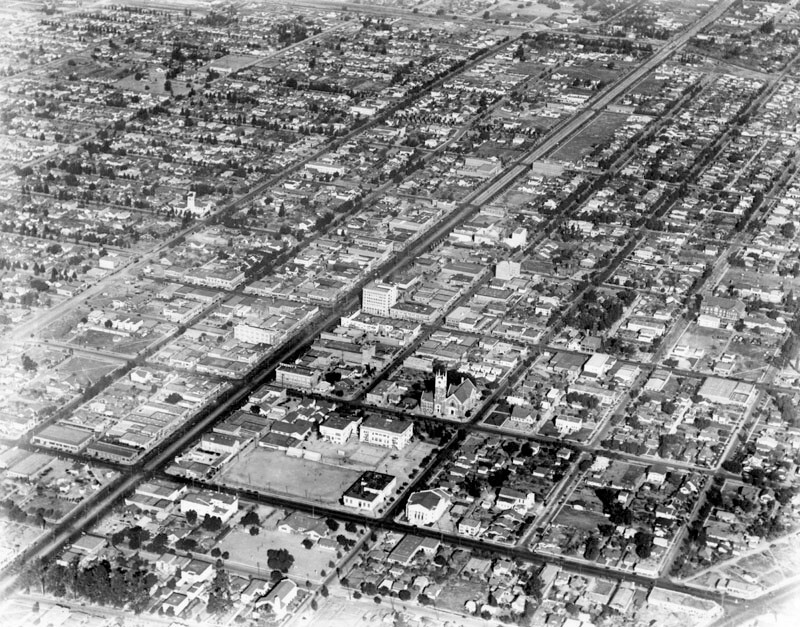 (1930s)#** - View looking south showing the Sears Building located on the southeast corner of Central and California avenues in Glendale. 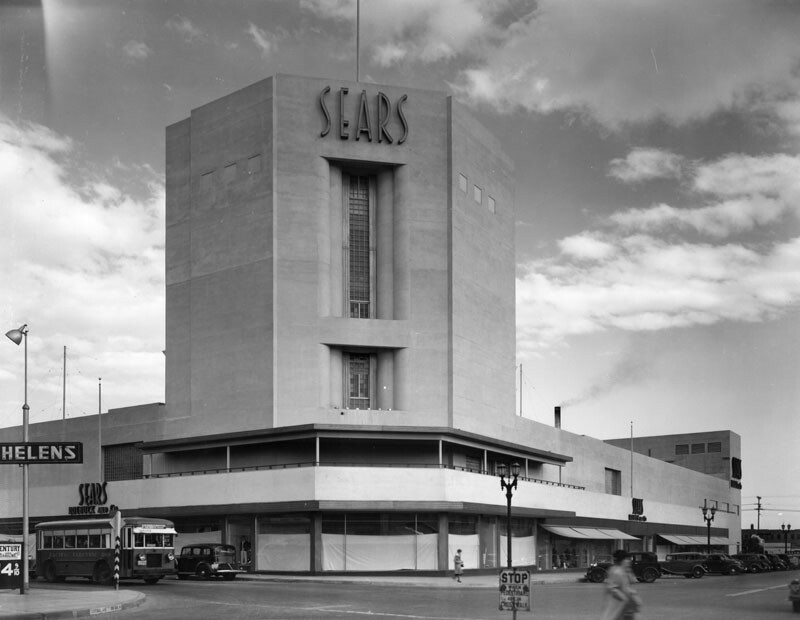 (1930s)* – Close-up corner view showing the Sears Roebuck and Co. tower. (1930s)* – View looking north showing Sears Roebuck and Co. located at 236 N. Central Ave. Notice how the house on the right had been repurposed as a clinic. Though the structure is long gone, a medical clinic still occupies the lot just south of the Sears today. Click HERE to see contemporary view. (ca. 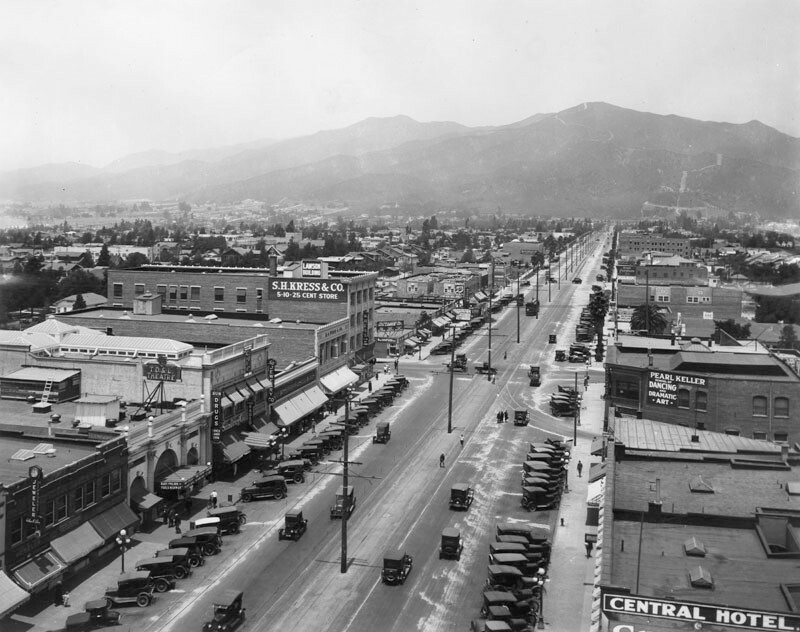 1925)* - Panoramic view of Glendale along Central Avenue looking north from Colorado Blvd. 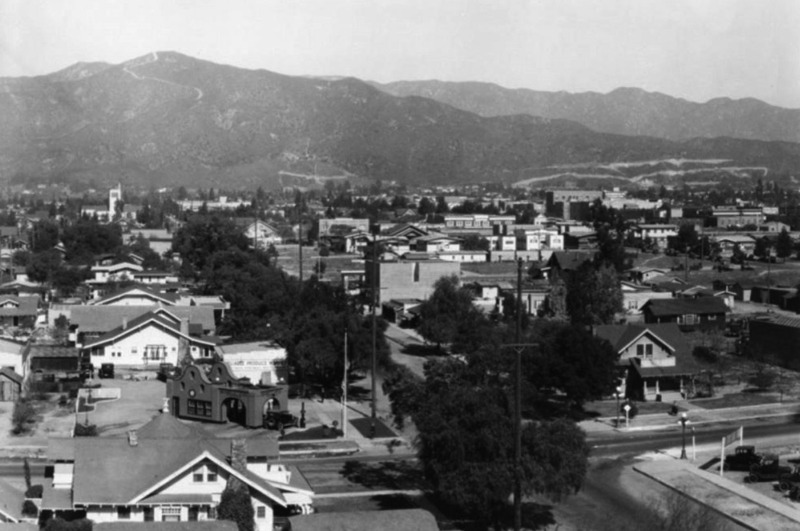 (1930)* - View showing North Central Avenue in Glendale. The building on the right has a Radio service shop, Beauty Shoppe, "Billie Bird Market" and a drug store. The building on the left has "Bradstreet Market Groceries & Meats" and a dry goods shop. In the center left there is a building with rooms for rent and a Community service station with tire repairing. 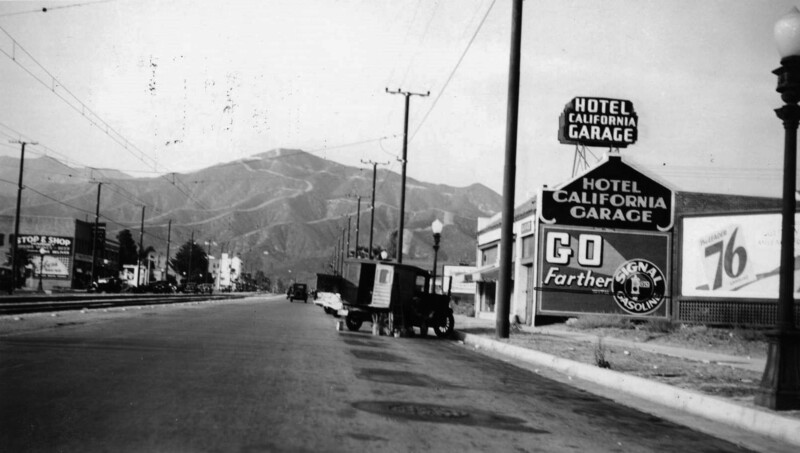 (1930)^ - View of the southwest corner of Brand and Colorado, in Glendale. Several businesses are seen in the area, including "Mac's", a cigar, candy and sandwiches store located at the corner. Click HERE to see contemporary view. 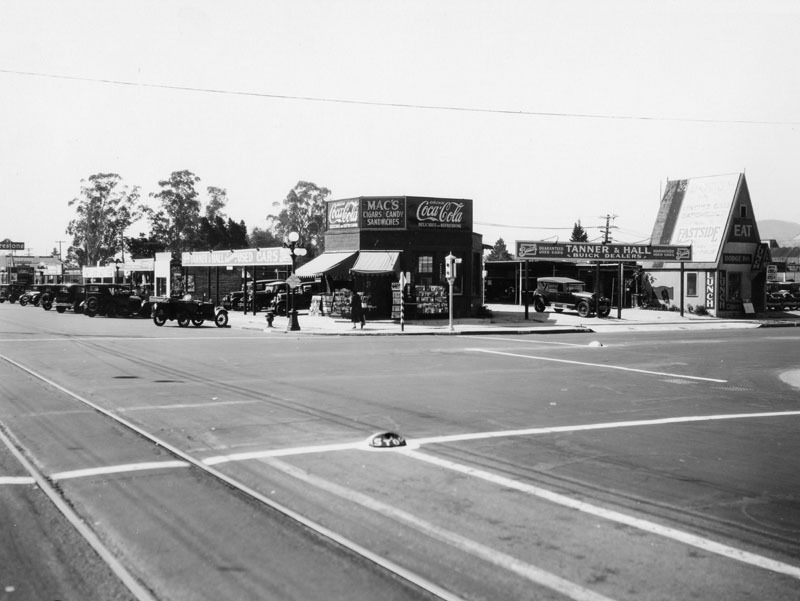 (1930)^ - View of the northeast corner of Brand Boulevard and Wilson Avenue. A small Texaco service station can be seen at the corner of the intersection. On the left (east side of Brand) is Weber's Cafe and a side profile of the Alex Theatre building. Click HERE for contemporary view. (1930)^ - View is west on Wilson Avenue from Brand Boulevard. At the corner is Henry's Ice Cream which also serves lunch. Residential homes may be seen further down the block. Click HERE for contemporary view. 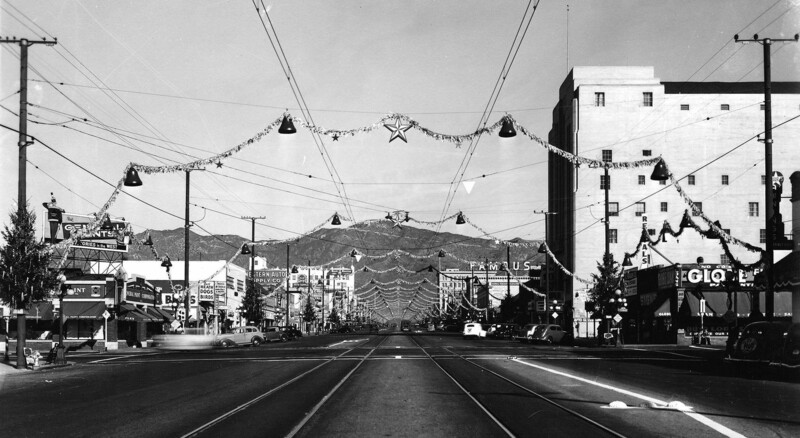 (1938)+++ – Day time view looking north on Brand during Christmas. 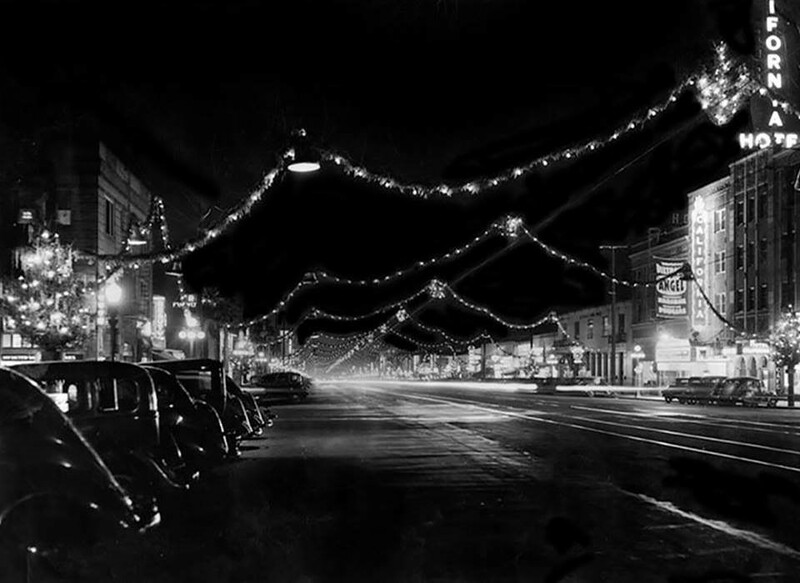 (1937)#+++ – Night view looking south on Brand Boulevard during the Holiday Season with the Hotel California seen on the right. (ca. 1938)^ - This view looking north on Brand at Wilson captures the Sontag, located at 200 North Brand. 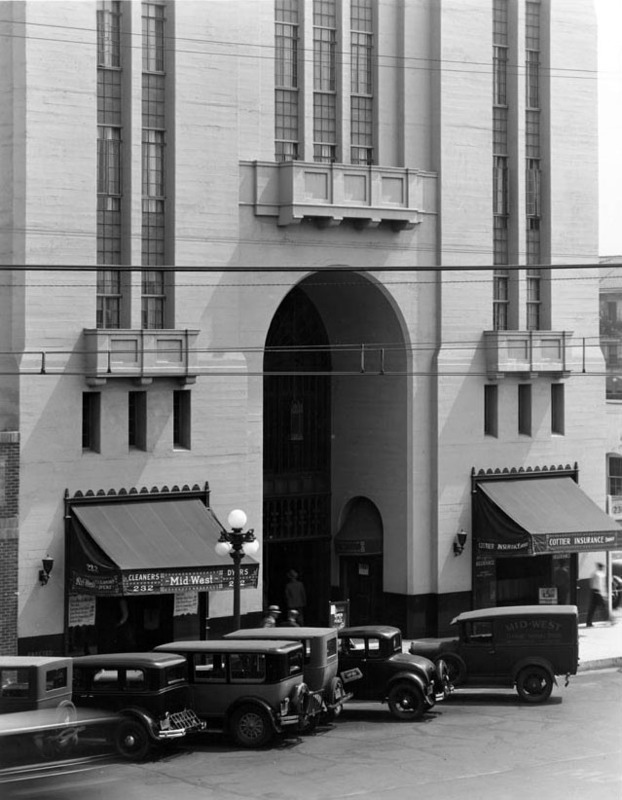 Just north of the drugstore is the Alexander Theatre (later the Alex Theatre) before the S. Charles Lee remodel (1940) and the addition of a 100 foot Art Deco tower. Sontag Drug Stores was one of the largest drug store chains in the U.S. in the 1930’s & 1940’s. It was also one of the first to allow customers to browse and choose their own products rather than requesting them from a clerk behind a counter. 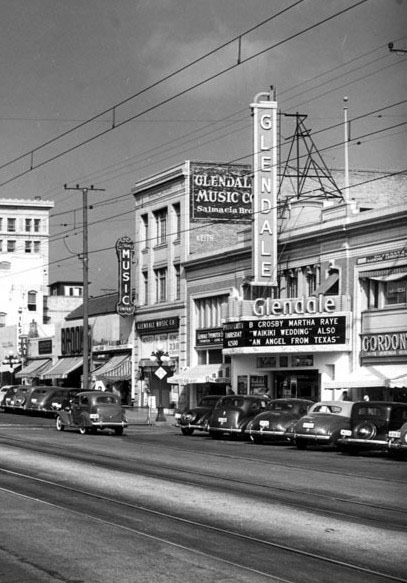 (1940s)^.^ – View looking north on Brand Blvd from near Harvard Street with the Glendale Theatre seen at center of the block. Paul Burgan’s Radio Service is on the right behind the ornate 5-bulb streetlight. 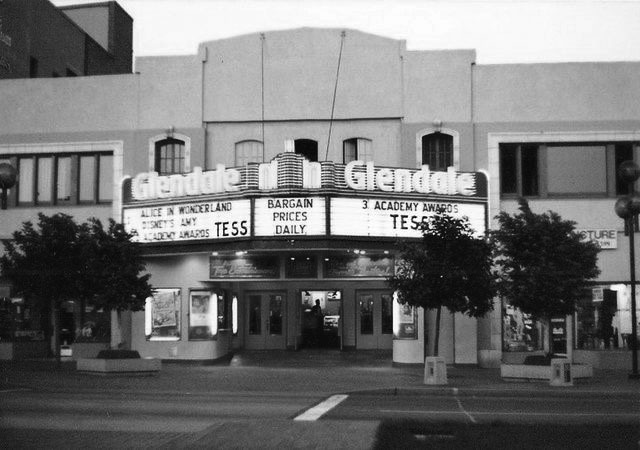 (1940s)^^* – View looking northeast showing the Glendale Theater located at 122 S. Brand Blvd. The Glendale Music Co. is seen just to the north of the theater. 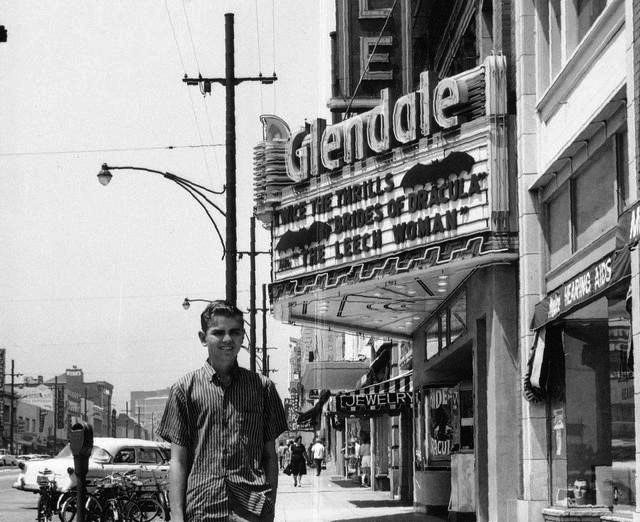 (1970)^^* – A boy poses in front of the Glendale Theatre. Note all the bikes parked in front of the theater against the curb. The marquee reads: TWICE THE THRILLS: “Brides of Dracula” and “The Leech Woman”. Photo courtesy of Joel Sandell. A DSW Shoes is now located where the Glendale Theatre once stood. Click HERE for contemporary view. (ca. 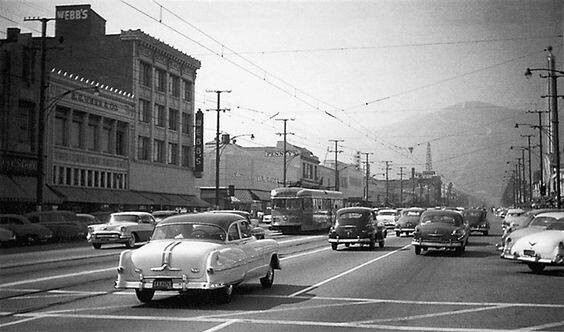 1952)#+++ – View showing the Hotel California and California Theatre, located on the southwest corner Lexington Dr. and Brand Blvd. 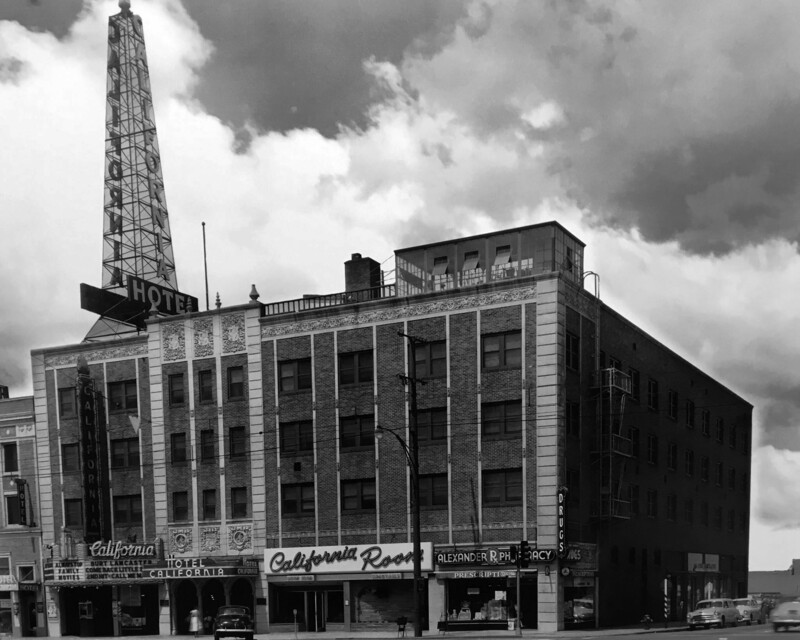 Built in 1927 and occupied in 1928, the California Hotel, along with the Glendale Hotel (Broadway and Glendale Ave), were the city’s “nicest places” for visitors to stay in the 1930s and 1940s. The California was among only a few hotels in greater Los Angeles that included a full-sized theater. (ca. 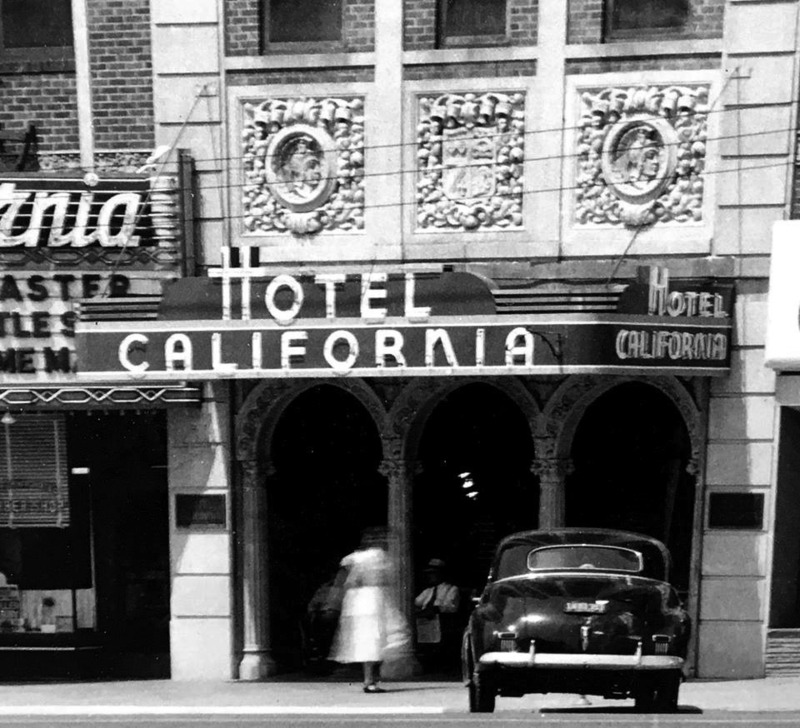 1952)#+++ – Close-up view showing the entrance to the Hotel California aka California Hotel (1927-1966). When motels became popular in the late 40s and thereafter, popularity of the California Hotel began to fade. The hotel was demolished in 1966 and replaced with a Bank of America building. 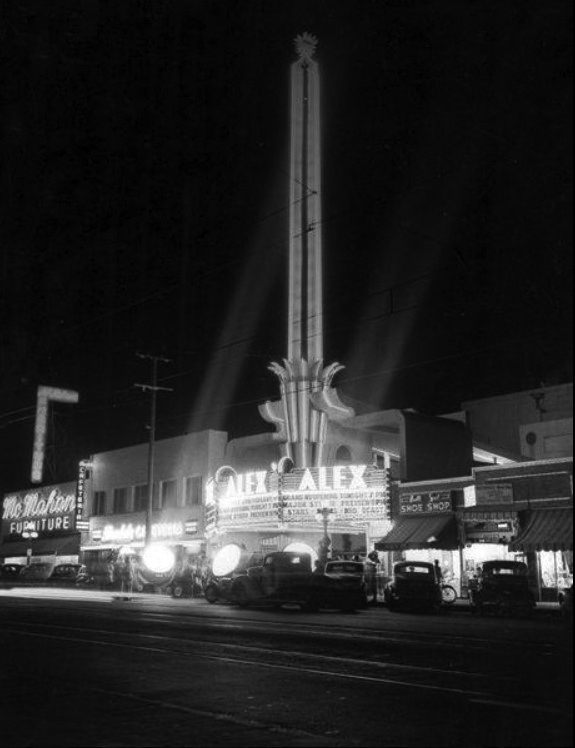 (1940s)##^* - Spotlights draw attention to what appears to be a film premiere at the Alex Theatre, located at 216 N. Brand Boulevard. (ca. 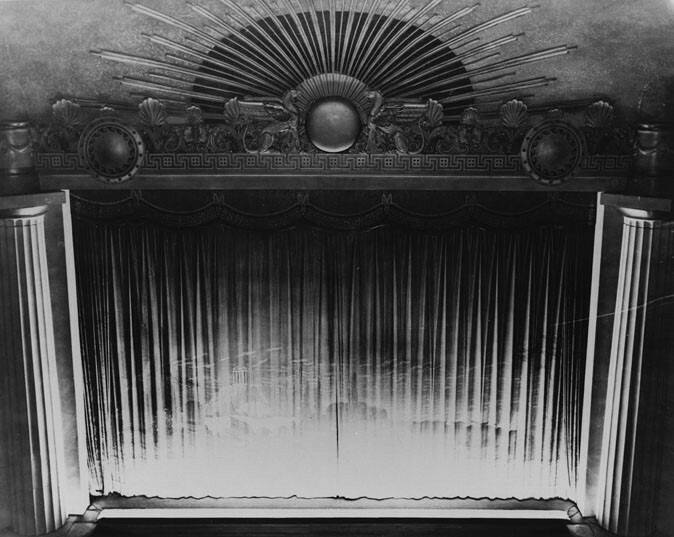 1937)^ - Interior view of the Alex Theatre showing the decorative stage curtain, done in a Grecian motif, and enclosed by column on both sides of the stage. (ca. 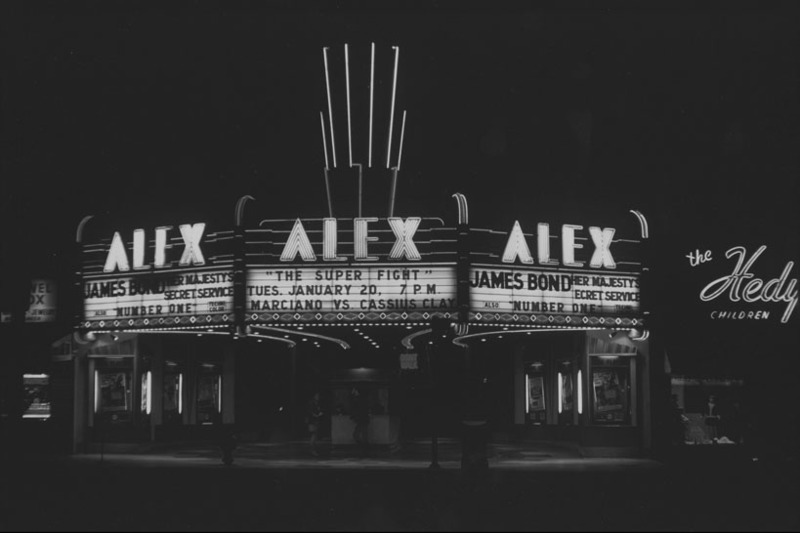 1969)^ - Close-up night view of the Alex Theatre (originally known as the Alexander Theatre) located on Brand Avenue in Glendale. The James Bond film "Her Majesty's Secret Service" and "The Super Fight" of Marciano versus Cassius Clay are advertised on the marquee. (ca. 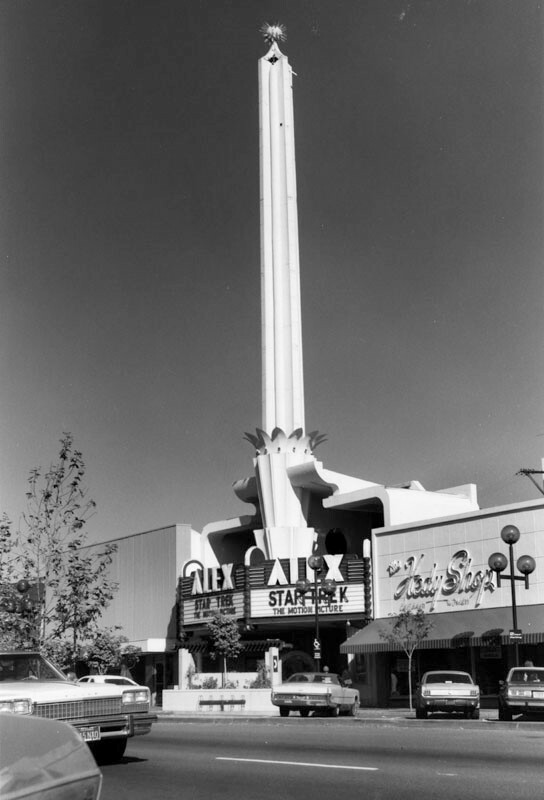 1979)^ - Exterior view of the Alex Theatre located on Brand Boulevard. The film "Star Trek" is advertised on the sign. The exterior of The Hedy Shop, a clothing store for women and children, is visible on the right. Click HERE for contemporary view. 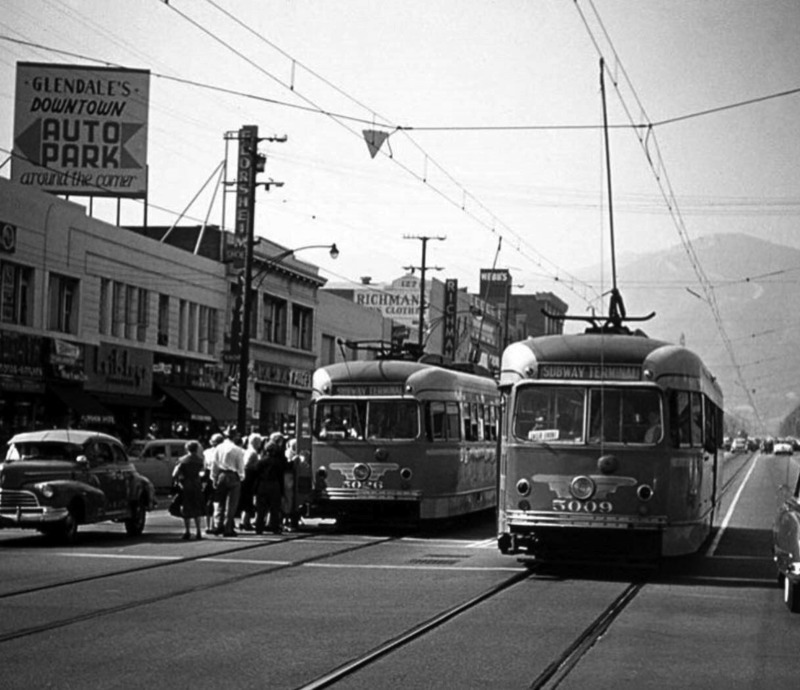 (1955)++# - View looking northeast at the corner of Brand Boulevard and Wilson Avenue showing two streetcars inbound to LA on the next to the last day of PE service to Glendale, 6/18/1955. The tower and roof of the Alex Theater rise in the background. (ca. 1955)+++ – View looking north on Brand Boulevard with Webb’s Department Store is seen at left on the southwest corner of Brand Boulevard and Wilson Avenue. 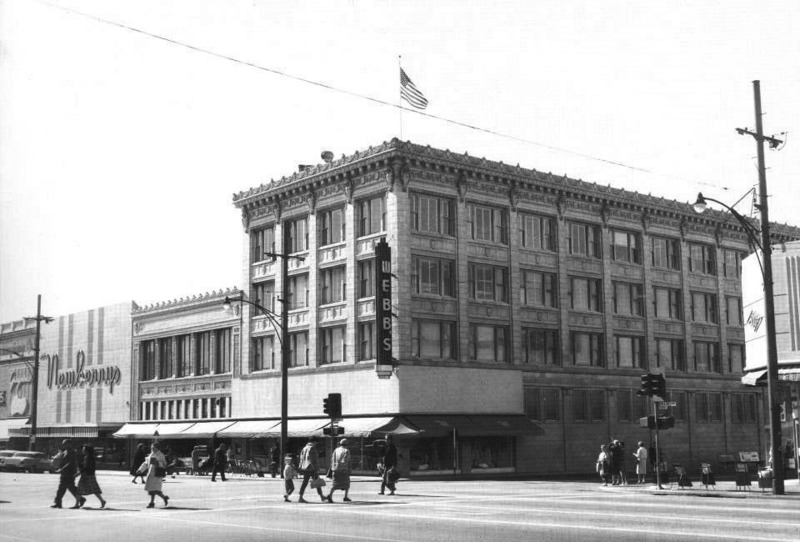 Webb’s department store was the cornerstone of shopping for the Glendale community. It was locally owned and operated and expanded to several other buildings nearby. Harry S. Webb came to Glendale in 1916 from Chicago, convinced that California offered a great opportunity for a department-store business. His first Webb’s store was near the corner of Brand Boulevard and Broadway. 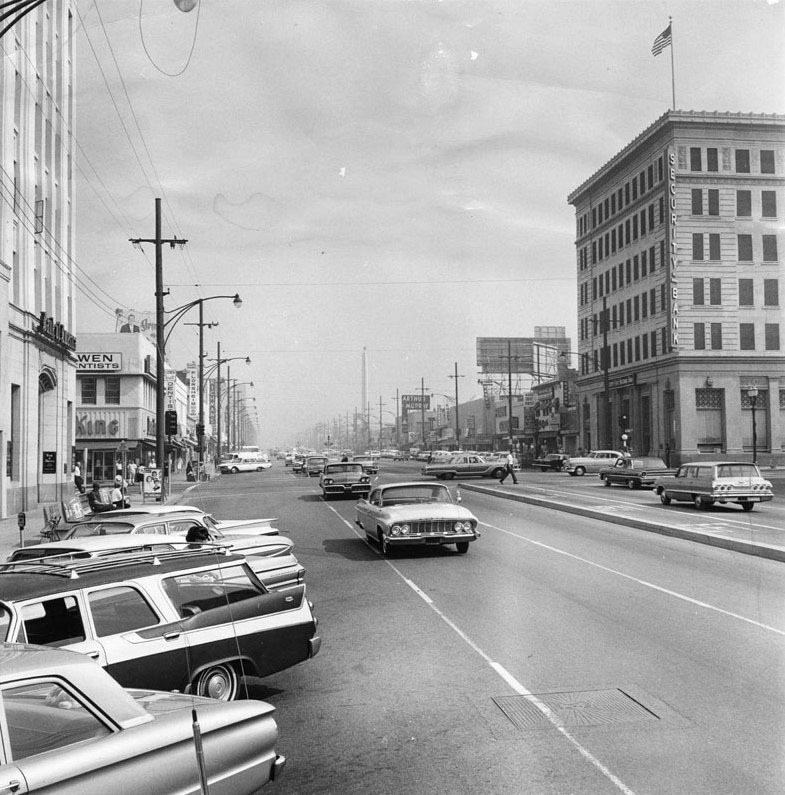 (1962)*** – View looking at the intersection of Brand Boulevard and Wilson Avenue, showing Webb's Department Store standing on the southwest corner. Newberry's Department Store is seen further south on the left. 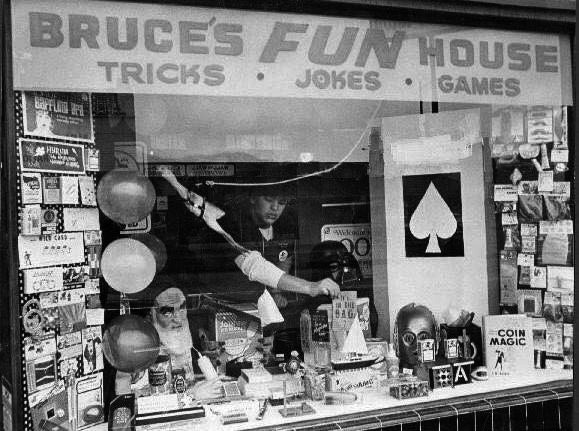 (n.d.)^.^ - View looking through the display window of Bruce’s Fun House located on Wilson Ave between Brand Blvd and Orange St.
(1963)^ – View looking north on Brand Boulevard at Broadway. Click HERE for contemporary view. (ca. 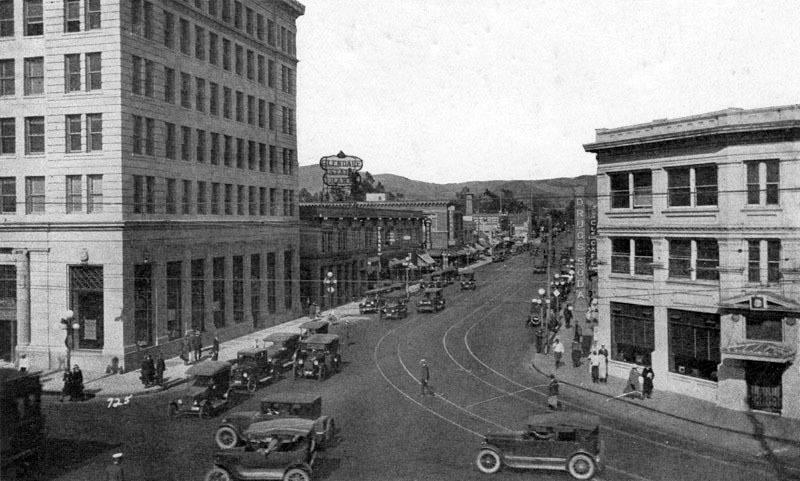 1924)^ - View looking north on Brand Boulevard at Broadway. 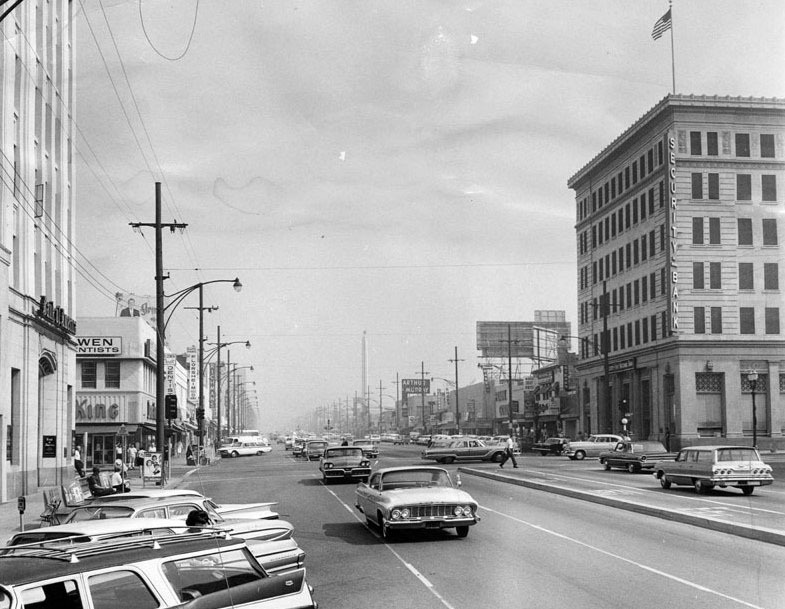 (1963)^ – View looking north on Brand Boulevard at Broadway. (ca. 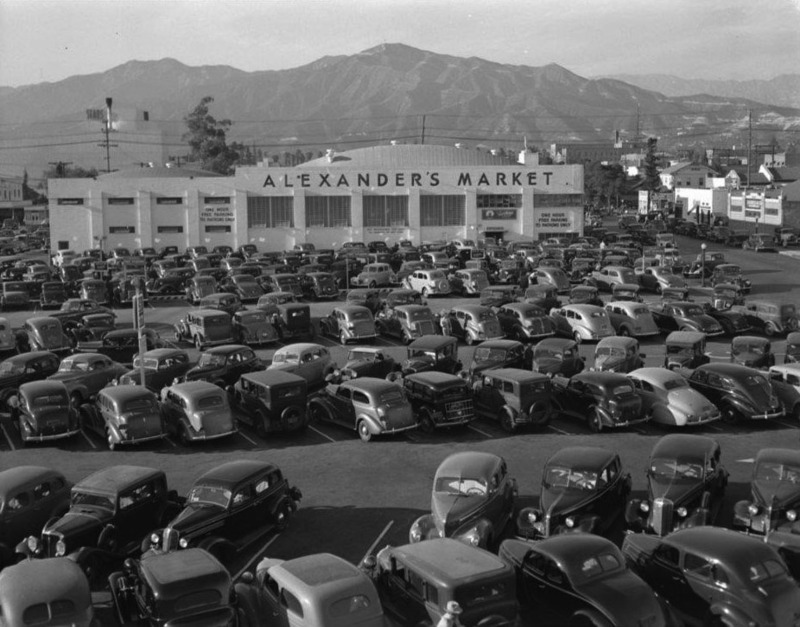 1940)^^ – View looking north showing a full parking lot in front of Alexander’s Market on Orange Street. In the 80s it was House of Fabrics, and then Joann's fabrics after that. 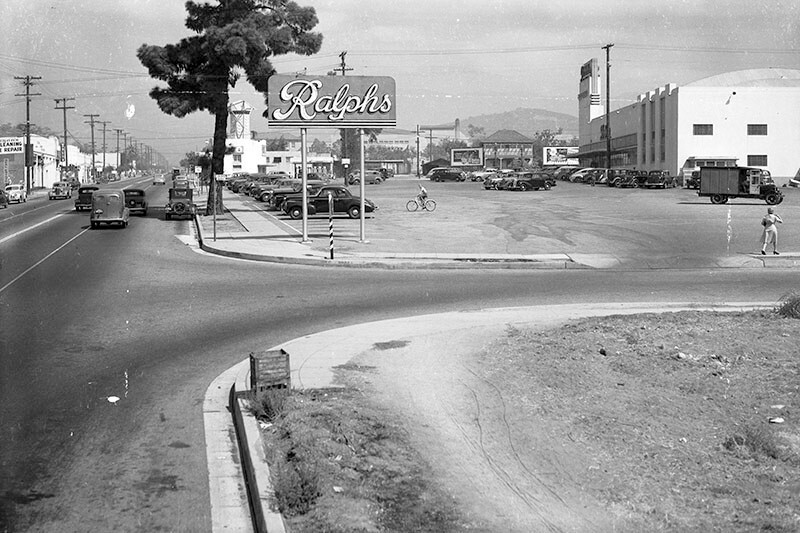 (1946)^ – View looking north on Verdugo Road at Dixon Street in Glendale, showing various businesses on the left and a large Ralphs supermarket (right). At the northern end of the parking lot is a Van De Kamp's windmill-shaped bakery (upper left) and a Shell service station. 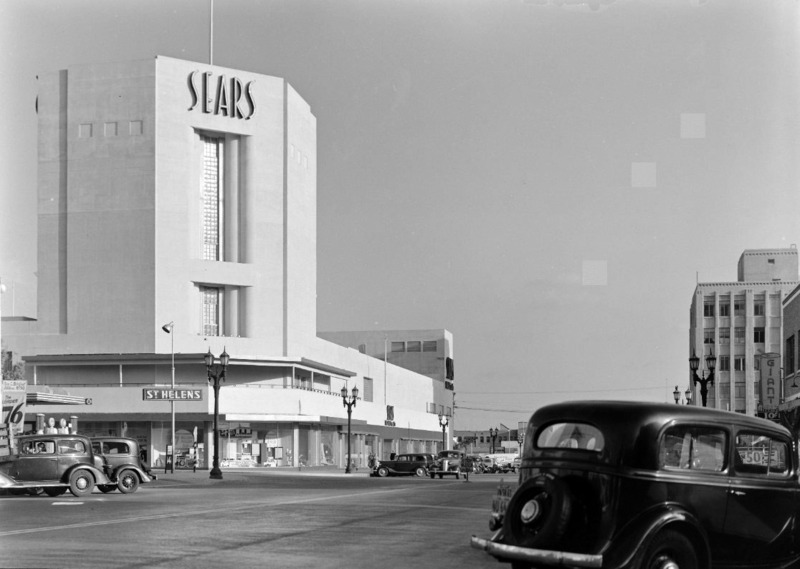 This corner is still occupied by a Ralphs supermarket, but the Art Deco structure, designed by Stiles Clements, has since been demolished and replaced with a larger store. Click HERE for contemporary view. 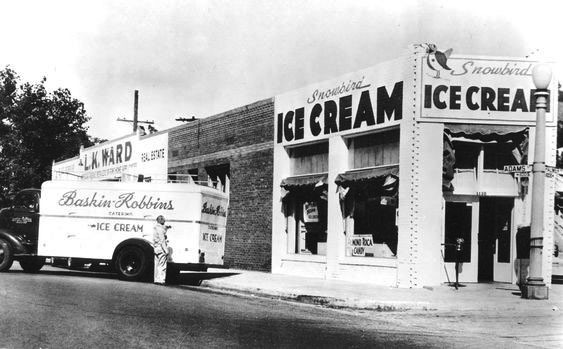 (1948)^.^ - Baskin-Robbins originally Snowbird Ice Cream, 1130 South Adams Street, Glendale. The building on the corner of Adams Street and Palmer Ave still exists. Click HERE for contemporary view. Baskin-Robbins started out as Snowbird Ice Cream. Actually, Irv Robbin’s ice cream parlor was called Snowbird before he merged with Burt Baskin’s Burton’s Ice Cream Shop. This photo was taken in 1948 at the Glendale, California store, where their ice-cream empire first started. The Baskin-Robbins ice cream parlors started as separate ventures of Burt Baskin and Irv Robbins, who owned Burton's Ice Cream Shop (opened in 1945) and Snowbird Ice Cream (opened in 1946), respectively. Snowbird Ice Cream offered 21 flavors, a novel concept at that time. When the separate companies merged in 1953, the number of flavors was expanded to 31 flavors. By 1948, Burt and Irv had opened six stores. The first franchise covering the sale of ice cream was executed May 20, 1948, for the store at 1130 South Adams in Glendale (Store #1). 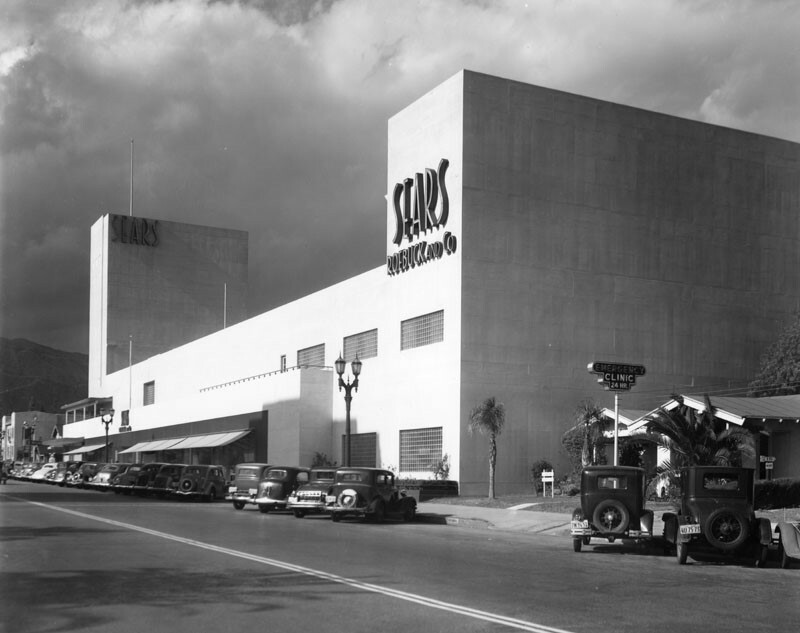 In 1949, the company’s production facility opened in Burbank. Burt and Irv made the decision to sell the stores to the managers. In 1953, Baskin-Robbins hired Carson-Roberts Advertising who recommended adoption of the number 31 as well as the pink (cherry) and brown (chocolate) polka dots and typeface that were reminiscent of the circus. 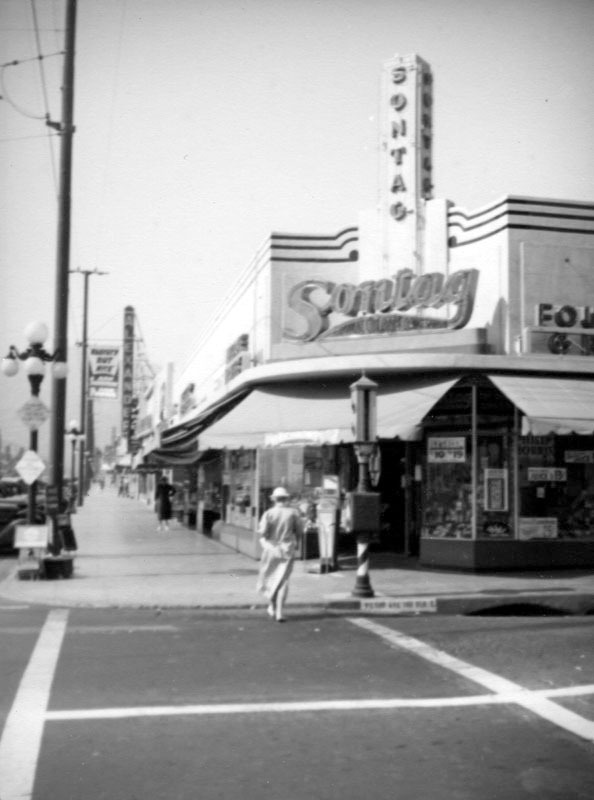 The first store that adopted the new 31 look was 804 North Glendale Ave. in Glendale, in March 1953. Between 1949 and 1962, the corporate firm was Huntington Ice Cream Company. The name succeeded The Baskin-Robbins Partnership and was eventually changed back to Baskin-Robbins in 1962. 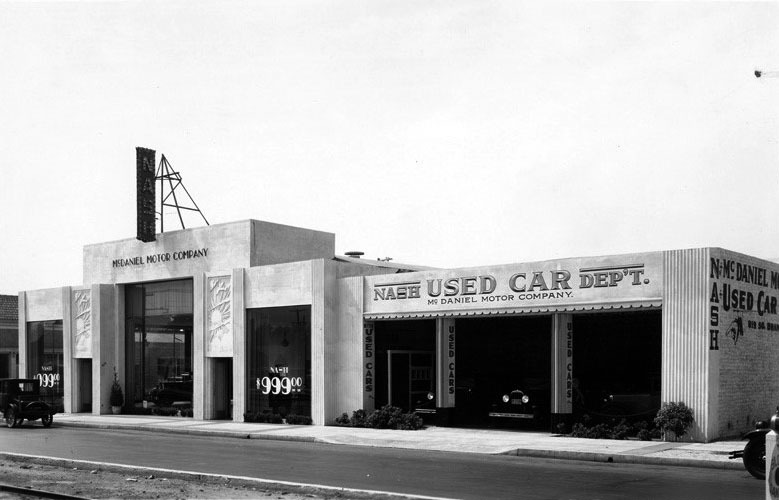 (1949)#^* – View showing Towers Motors, a Lincoln Mercury dealership located on Colorado Street in Glendale. 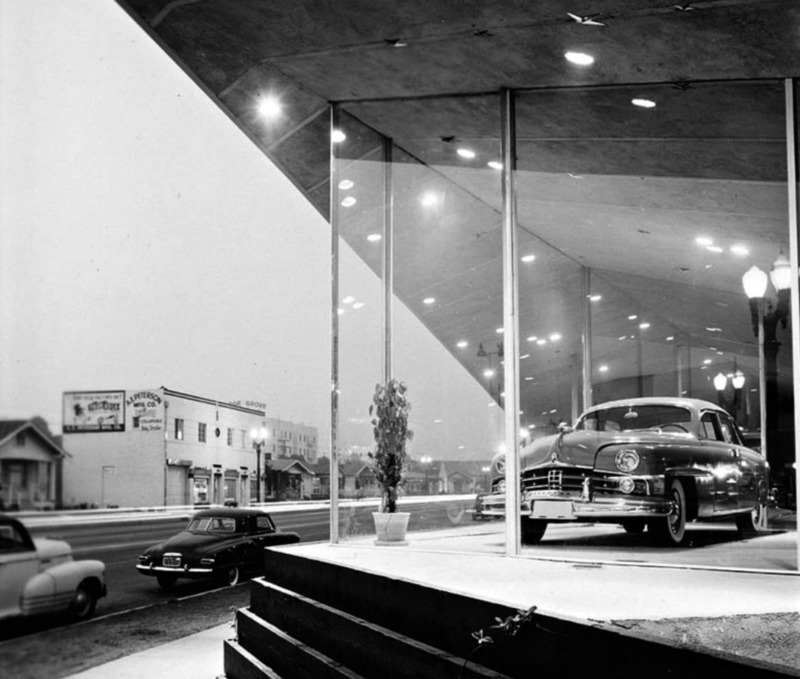 The Googie-style building located at 600 E. Colorado Street was designed by John Lautner. This beautiful building no longer stands. The price for a brand new 1949 Mercury woody wagon (as seen above) was a whopping $2,500.00. 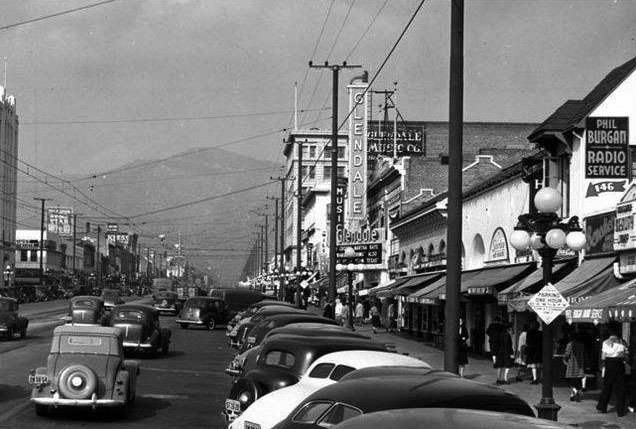 (1949)#^* – Close-up view, looking southwest, showing the Towers Motors showroom with Colorado Street seen in the background. (ca. 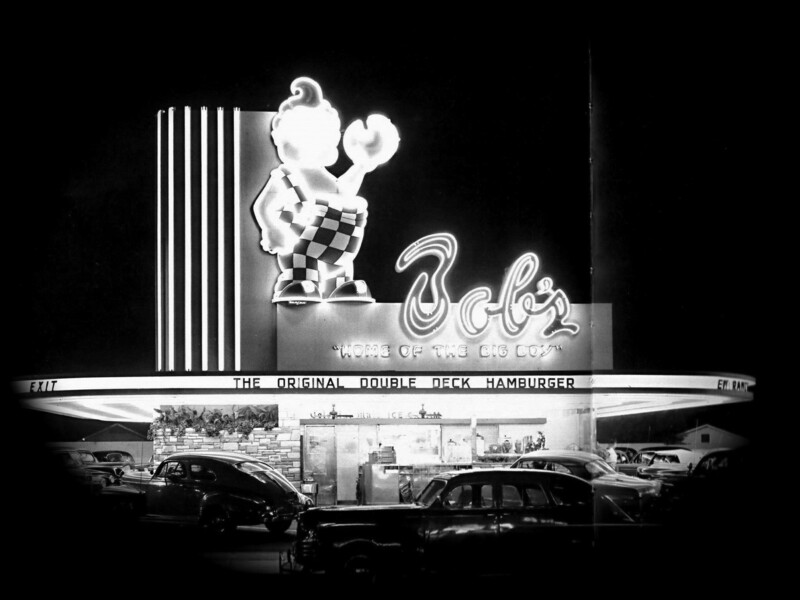 1949)**^ – View showing Bob’s Big Boy Drive-in restaurant located at 900 E. Colorado in Glendale. Bob's Big Boy restaurant chain was founded by Bob Wian in Southern California in 1936, originally named Bob's Pantry. (ca. 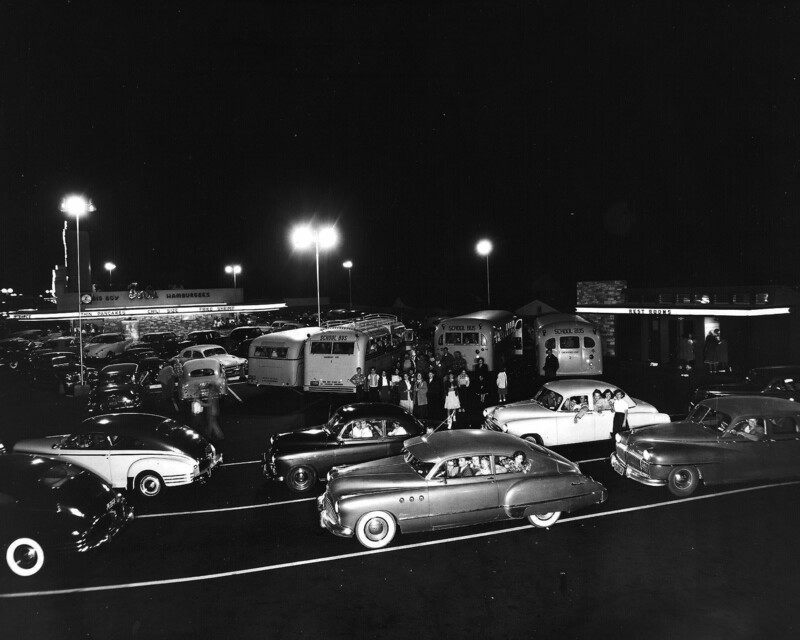 1949)**^ – Night view showing a very crowded Bob’s Big Boy Drive-in Restaurant at 900 E Colorado in Glendale. (ca. 1950)^.^ - Proof positive that Bob's was the place to be in the early 1950's! This picture shows the mob, and line of cars waiting to get into the "twin drive in and coffee shop" at 900 E. Colorado, Glendale. Bob’s Big Boy became a cultural icon for Glendale teenagers in the 1940s up until the 1970s. 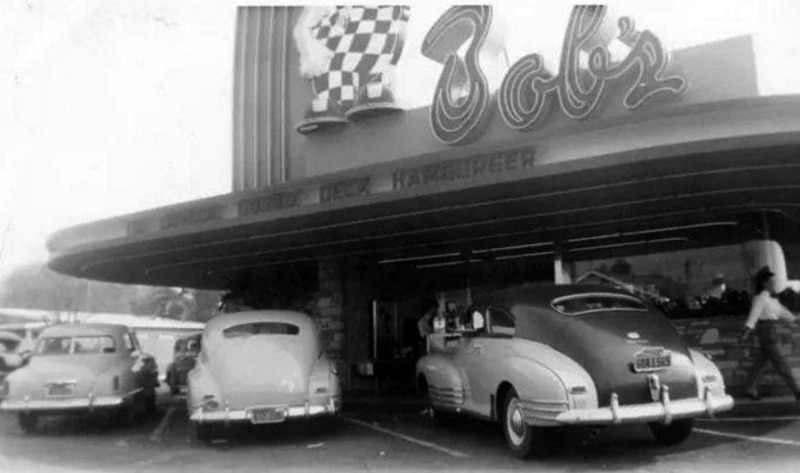 After the widely popular Glendale and Hoover High School football games, lines of cars filled with local students would eat at Bob’s Big Boy on Colorado Street. Opened May 17, 1948 rebuilt and reopened December 1956 at 121 E. Broadway Ave. The building still stands, but many remodeling jobs over the years have left it unrecognizable. It now houses a Chinese restaurant. Click HERE for contemporary view. 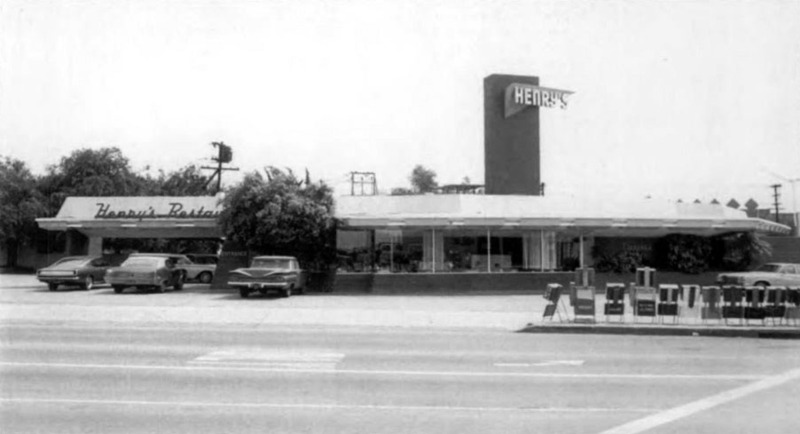 (1977)*^* – View showing Henry’s Restaurant located on the SE corner of Colorado Street and Glendale Avenue. Henry's was known for its "Chicken in the Rough" meal. Also for its Fried Chicken Livers and Gizzards. Click HERE to see menu. 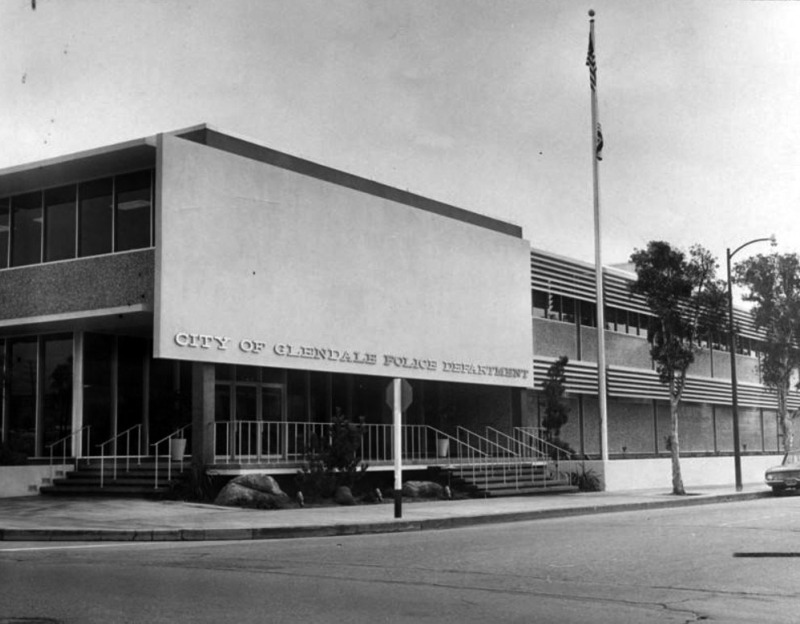 (1960)^ - Photograph caption reads, "Spanking new headquarters for Glendale Police Force is 1,000,000, two-story building at Wilson Avenue and Isabel Street. Glendale's 160-man force will now be under one roof in new building. Formerly, part of police department was in old police building at 111 N. Howard St. and part in utility building." Valley Times photo date: November 8, 1960. Click HERE for contemporary view. 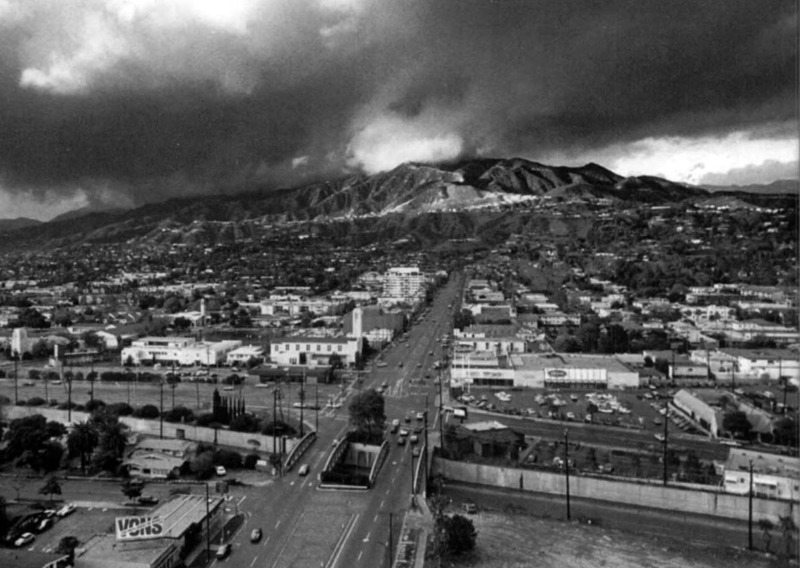 (1982)*^* – View showing north Brand Boulevard at the Verdugo wash with the Incarnation Church at left and the Ralph’s grocery store at right. 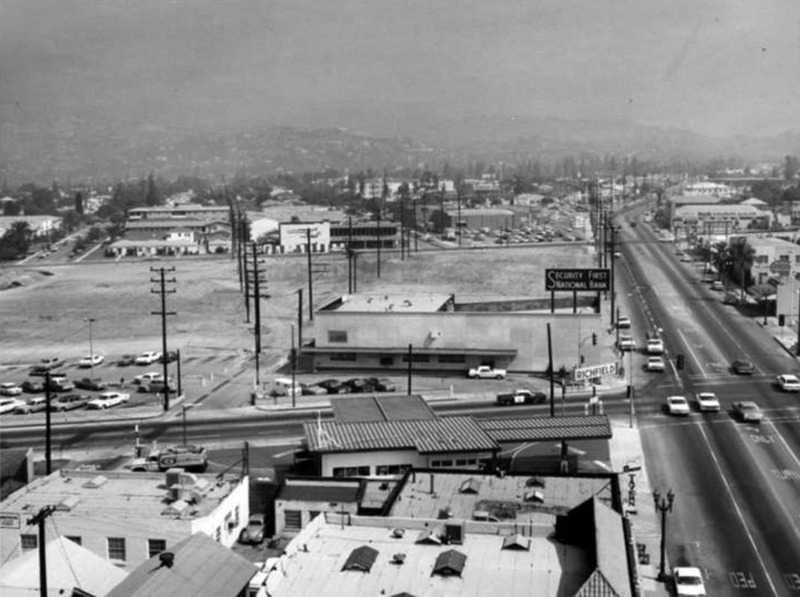 (1966)##^ – View showing the intersection of Glendale and Wilson avenues, with Secutiry First National Bank and Richfield gas station on the NW and SW corners, respectively. This land was cleared for the Glendale Fashion Center. Click HERE for contemporary view. Developed by Glendale Associates, a partnership between J.S. Griffiths Co, Broadway Hale Stores and M.J. Brock & Sons, the Glendale Galleria opened on October 14, 1976. 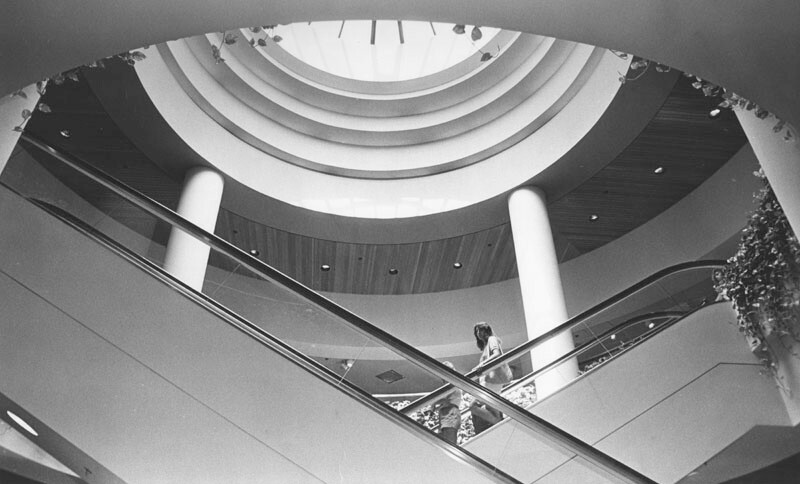 The architect was Jon Jerde, who credited his design to a Ray Bradbury essay on reviving retail districts. The mall began with four anchor stores: Buffum's and The Broadway, which opened in August 1976; Ohrbach's, which opened in October, 1976; and JCPenney, which opened in November of that year. 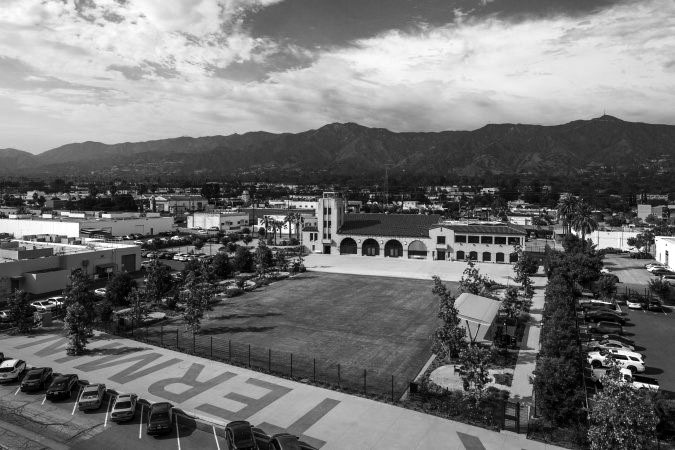 When incorporated in 1906, Glendale consisted of only 1,486 acres. By 1920, the City had grown through nine annexations to over 7,000 acres. From 1920 to 1930, ten annexations brought the total area to 12,294 acres. 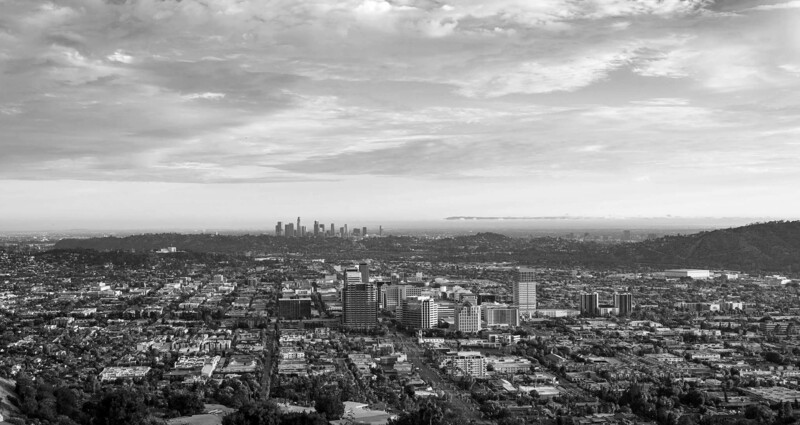 (2017)*# – Panoramic view of the City of Glendale as seen from the Verdugo Moutains. As of 2014, Glendale had a population was 200,167, making it the third largest city in Los Angeles County and the 23rd-largest city in California. Glendale has one of the largest communities of Armenian descent in the United States. In 2013, Glendale was named LA's Neighborhood of the Year by the readers and editors of Curbed.com. Water and Power Associates, Inc. is a non-profit, public service organization dedicated to preserving historical records and photos. We are of the belief that this information should be made available to everyone—for free, without restriction, without limitation and without advertisements. Your generosity allows us to continue to disseminate knowledge of the rich and diverse multicultural history of the greater Los Angeles area; to serve as a resource of historical information; and to assist in the preservation of the city's historic records. 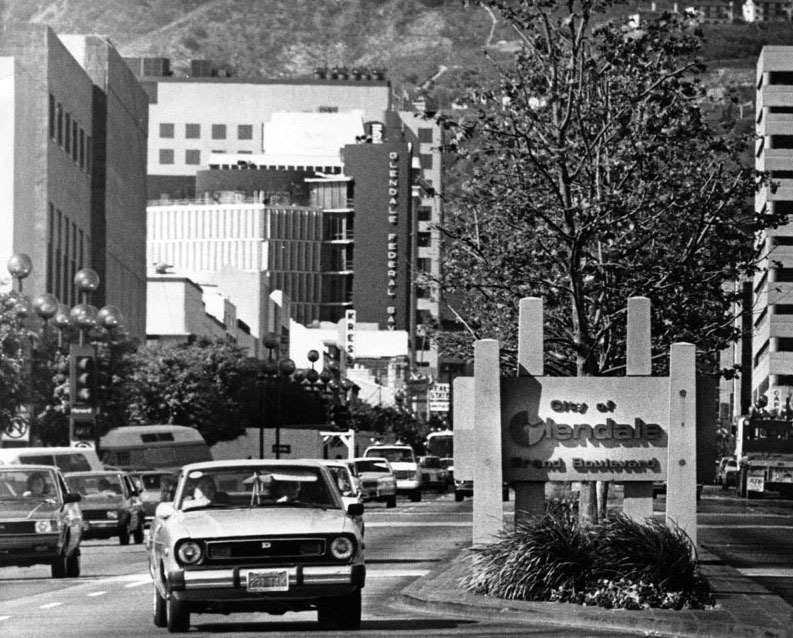 +++Facebook: Vintage Glendale "The Jewel City"